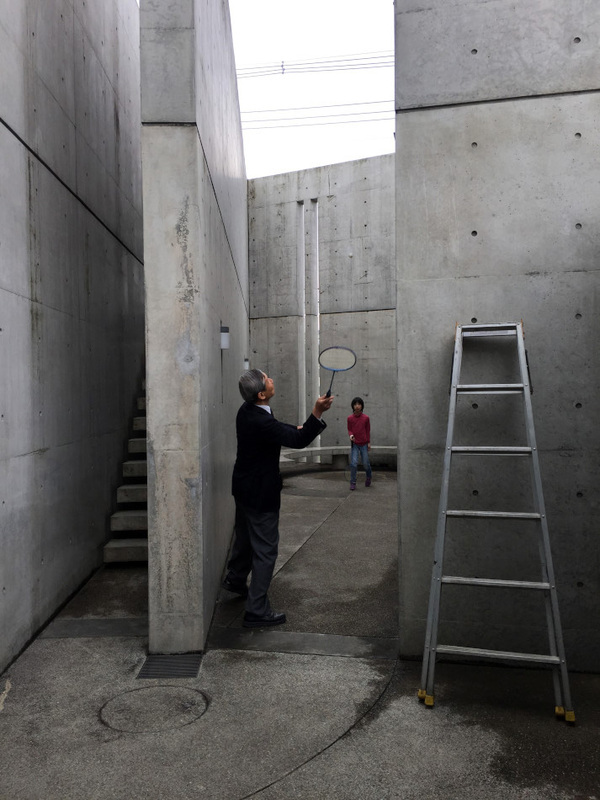 If there was one architect that redefined Japanese architecture during the 1990s it would be Tadao Ando. 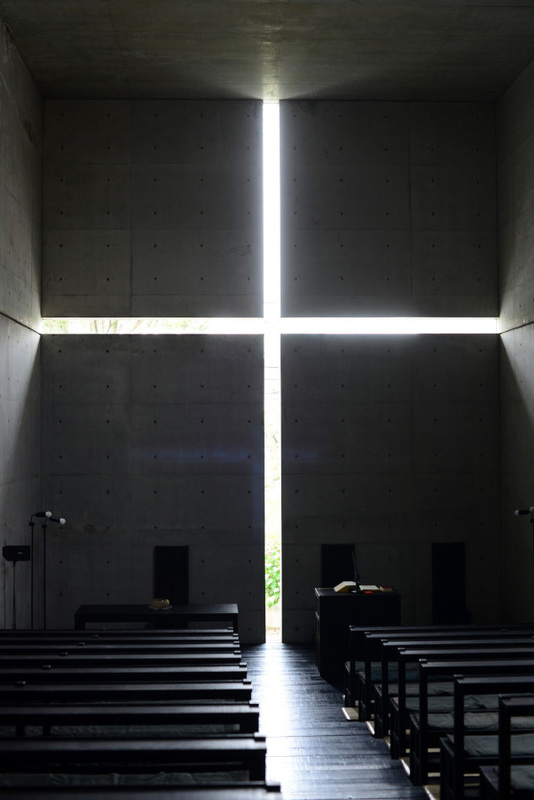 And if there was one project that best exemplified the essence of Ando’s architecture it would be Ibaraki Kasugaoka Church, or the Church of Light. 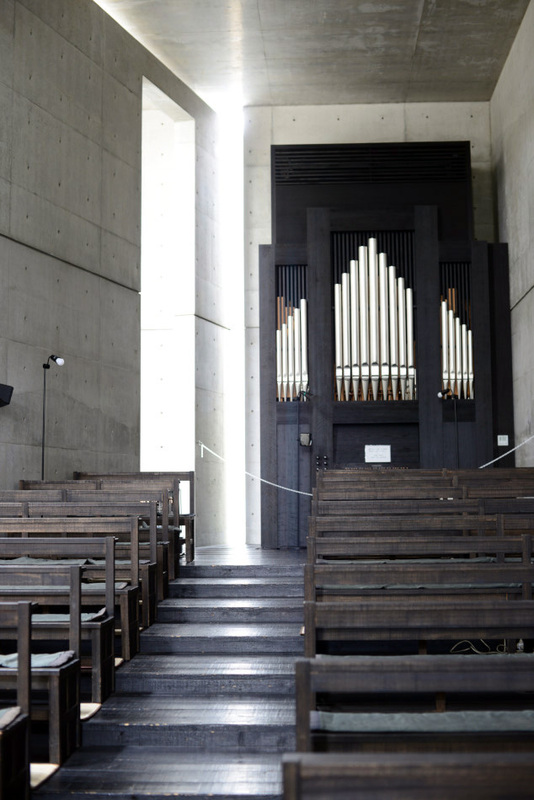 Located 25km northeast of Osaka, Ando’s Church of Light is a pilgrim destination in the world of architects and designers. 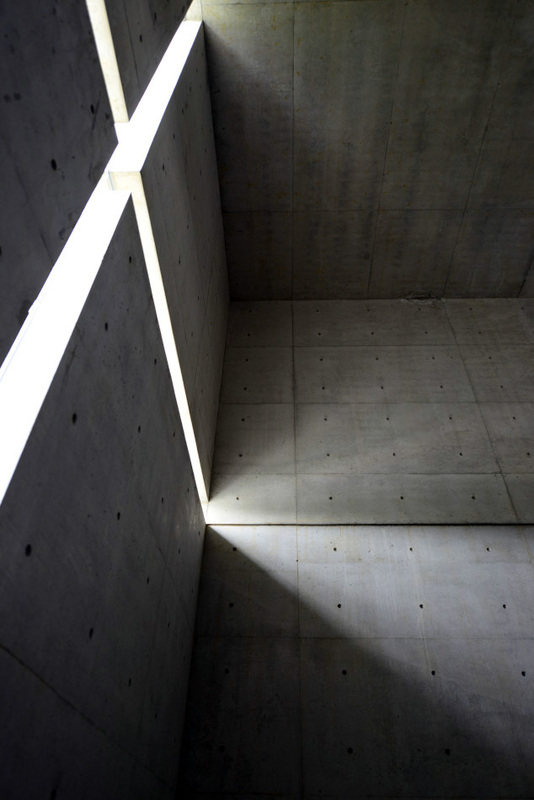 The precise use of natural light, minimalist layout, smooth pour in-situ concrete walls, modular spatial proportions, and zenist interplay of void and solid converges into an architectural masterpiece with a volume no bigger than a small house. The Church of Light opens only on specific days of the week, usually on Sunday but sometimes also Wednesday and Saturday. Visiting the church requires advanced reservation online. It was about 20 minutes of train ride from Osaka Station to Ibaraki, a residential neighborhood in the outskirt of Osaka. From Ibaraki station, it was another short local bus ride to reach the closest bus stop to the Church of Light. 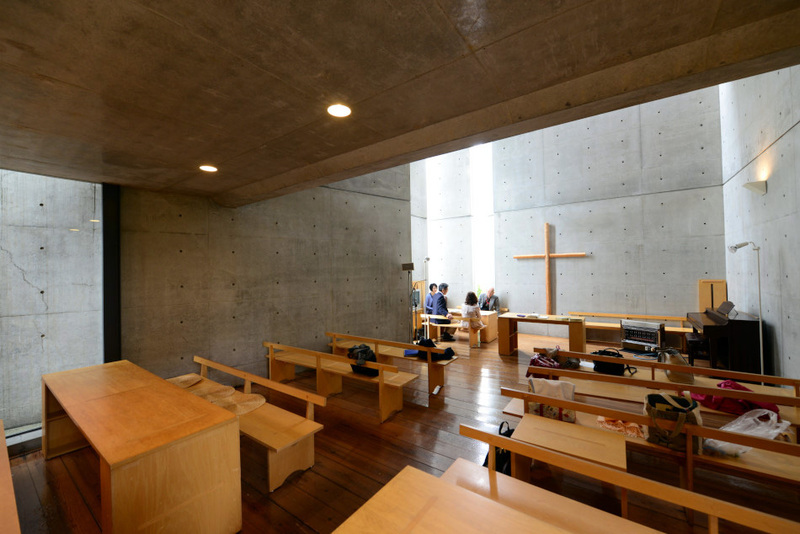 It was a peaceful Sunday when we visited, we found our way to the main entrance of the church complex, which was consisted of the Church of Light and the Sunday School, a latter addition to the complex also designed by Ando. We registered with the staff at the reception of the Sunday School, and was then led into the famous Church of Light. Once inside, we had all the time we needed to examine the architecture, take photos, and take in the spiritual atmosphere. 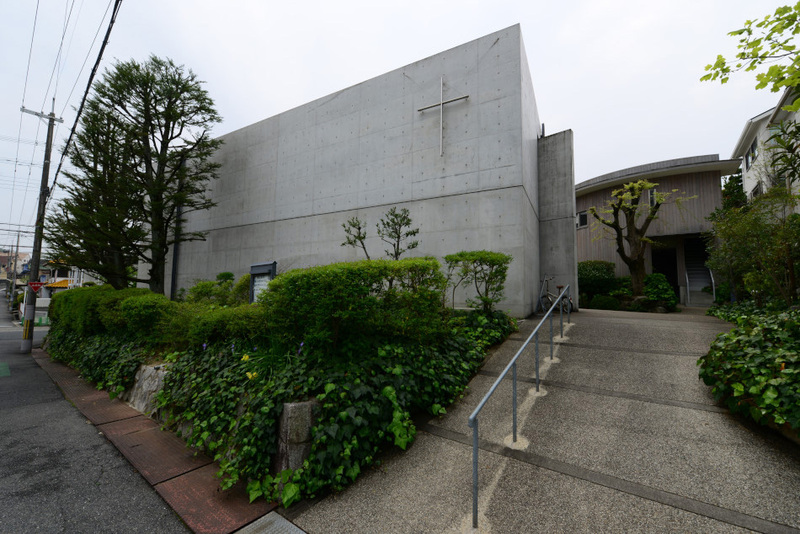 We stayed at the church for over an hour, until it was time for us to return to Osaka Tennoji Station, where we would take the Haruka Express for the Kansai Airport. 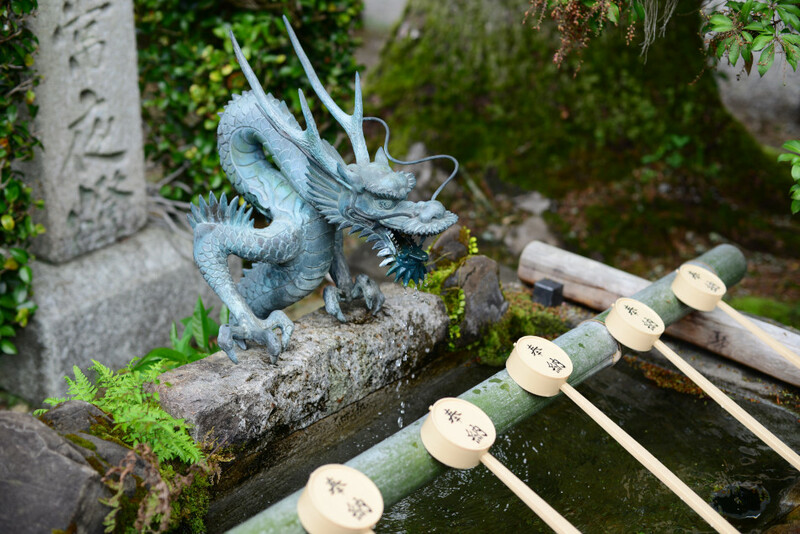 Nine days of Osaka, Kobe, and the spiritual Kumano Kodo gave us a refreshing spring break, with joyful memories from the splendid cherry blossoms, spiritual scenery, fantastic seafood, to poetic architecture. 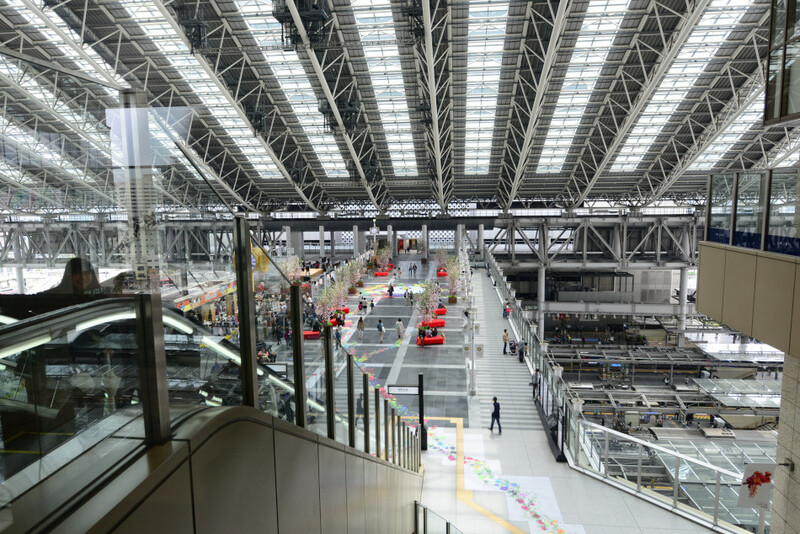 Osaka Station, with its recently added canopy. We got off the local bus at the community park at Ibaraki, where the Church of Light was just around the corner. 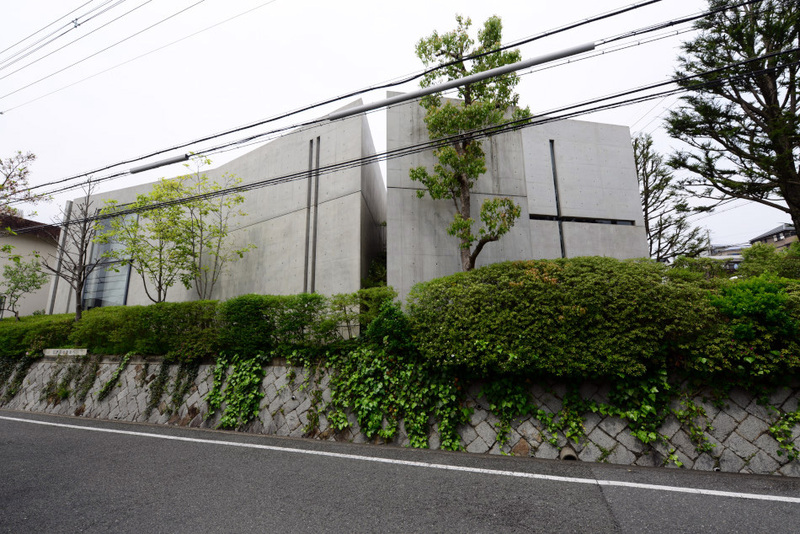 The church complex with the Sunday School on the left and Church of Light on the right, both designed by Tadao Ando. Entrance pathway to the church. 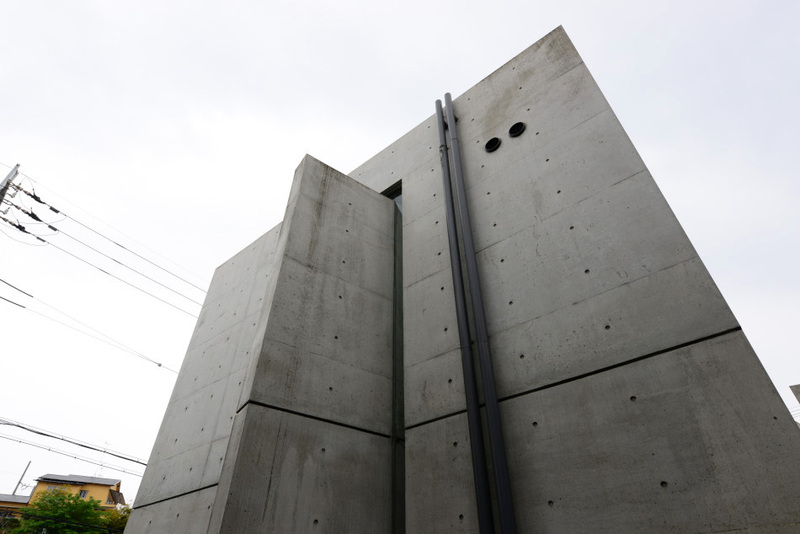 Slit windows and architectural concrete are the common design language in Ando’s works. Interior of the Sunday School. Overall interior view of the Church of Light. 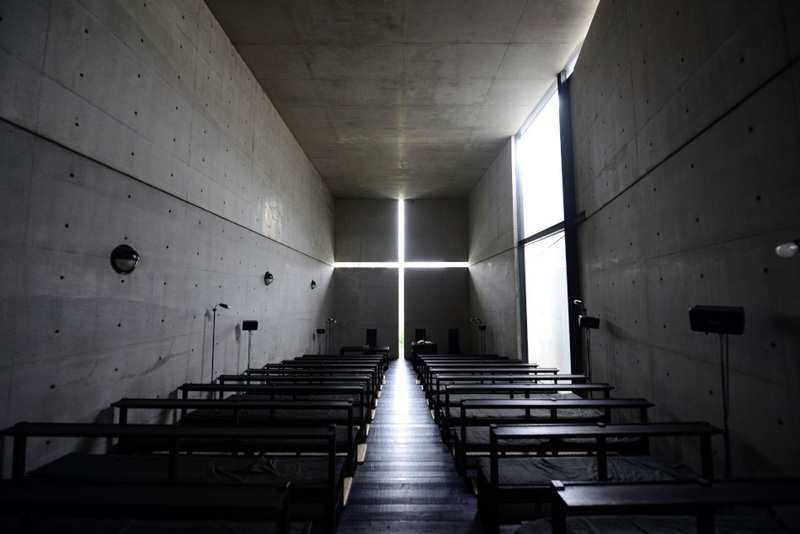 The iconic slit opening of cruciform in the Church of Light. The large pipe organ at the back of the church. 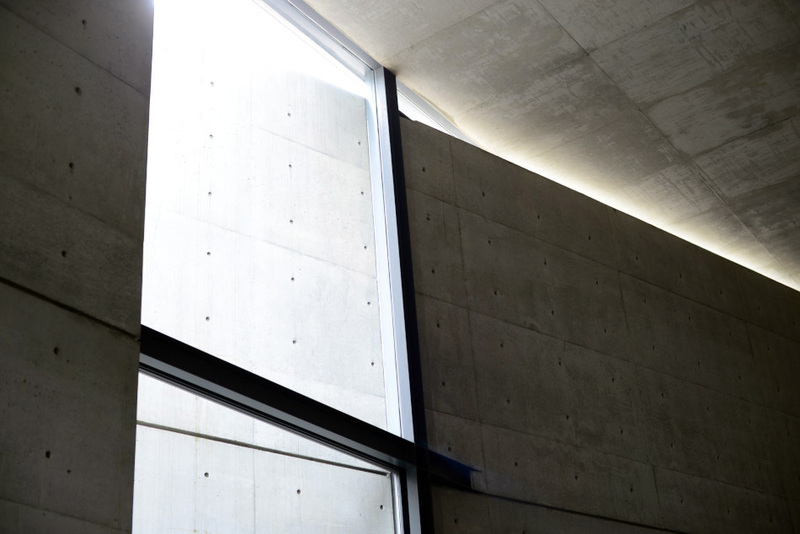 Indirect natural light is introduced into the space through an opening that is created by a slant wall at a 15 degree angle. Side view of the cruciform opening at the altar. Glazed wall meeting concrete wall at the church entrance. The curved vestibule connecting the Sunday School and Church of Light. A small outdoor gathering space between the school and the church, occupied by a man in suit playing badminton with a young lady. It was lovely to see how people making use of the space and we were both touched by this scene, for some reasons. 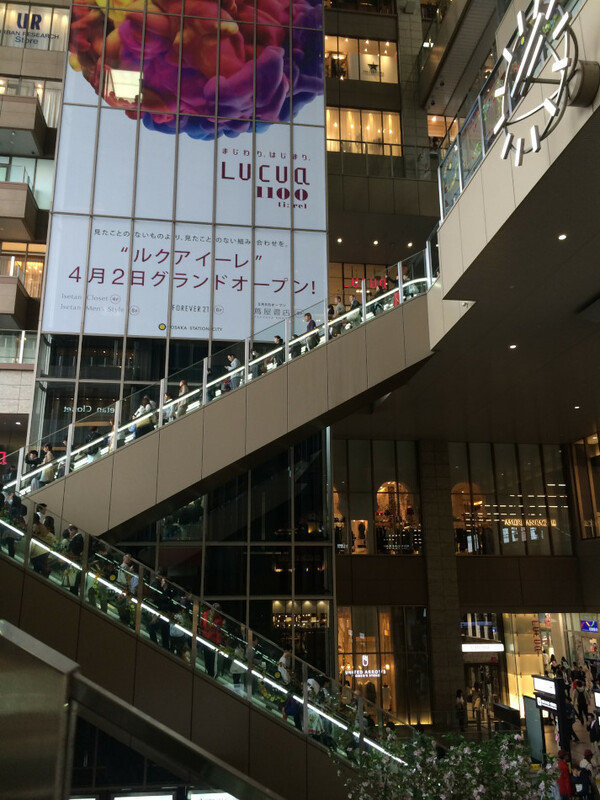 After a thorough visit to the Church of Light and a relaxing stroll in the laid back neighbourhood of Ibaraki, we returned to the Osaka Station. The station was busy and filled with people but somehow everything remained in good order. Before our train journey back to Osaka, we spent some time wandering around Kii Katsuura (紀伊勝浦), a fishing town about 25-minute bus ride from Nachisan. From the train/bus station, we walked through a covered arcade to reach the waterfront market near the main pier. 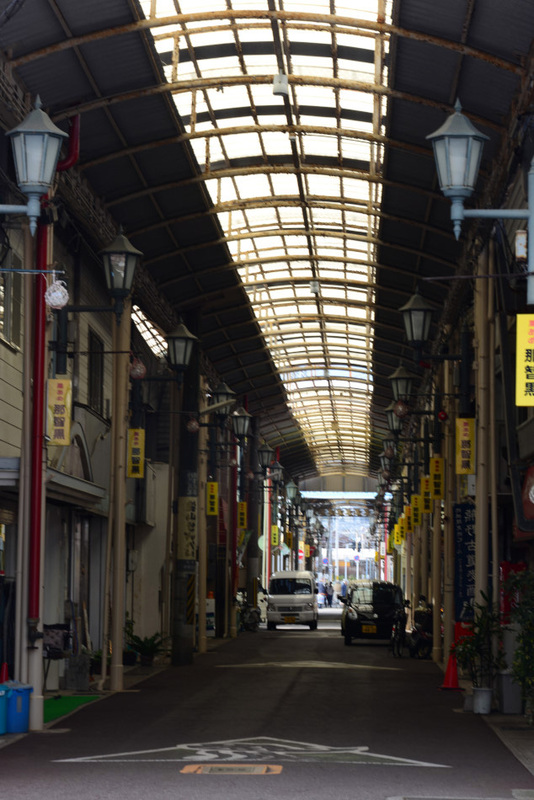 Most shops in the arcade were closed except several souvenir shops selling local souvenir such as the Nachi black candies, binchotan-zumi (a traditional Japanese charcoal) and Kii mandarins. 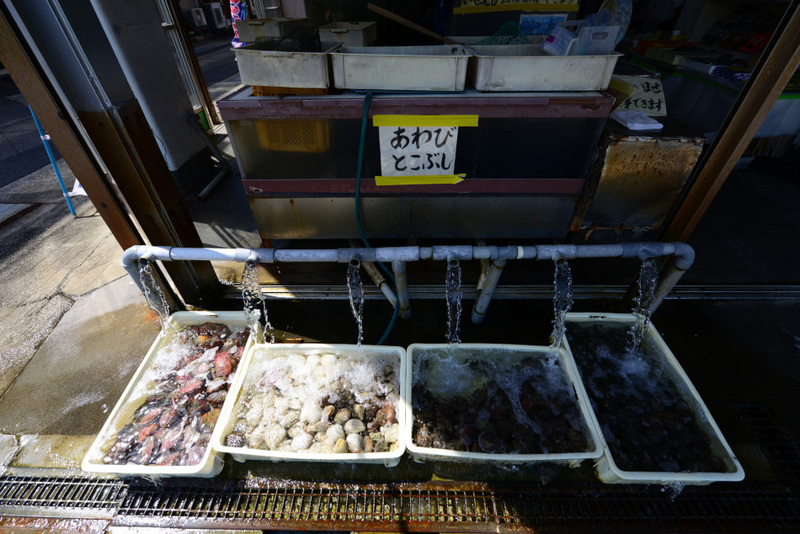 The fishing market was closed in the afternoon. 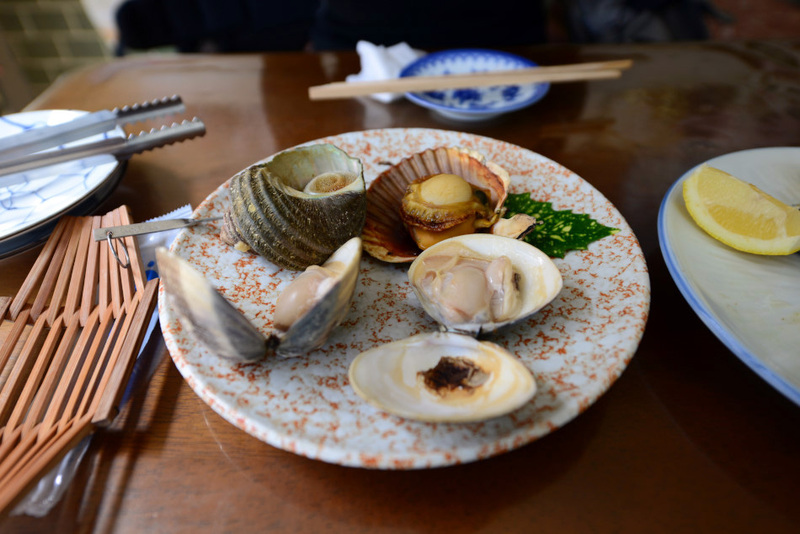 Attracted by the catch-of-the-day live display, we stopped by a local seafood store/eatery and had a delightful seafood lunch which included grilled abalone and assorted local shellfishes, miso soup with lobster meat and squid sashimi. After a satisfying meal, we strolled further out to the pier and had some relaxing moments under the afternoon sun and the refreshing sea breeze. Such pleasant afternoon provided us a perfect closure to our Kumano Kodo experience in the Kii peninsula of the Wakayama Prefecture. The town seemed sleepy as many stores at the waterfront market were closed in the afternoon. But in early morning, the market would present a completely different scene when fishing boats returned to the pier with loads of catches. There were some souvenir shops opened for business near the bus/train station, in the covered shopping arcade that connected the waterfront market with the train station. There were many restaurants in town but we found this simple corner seafood shop quite interesting. 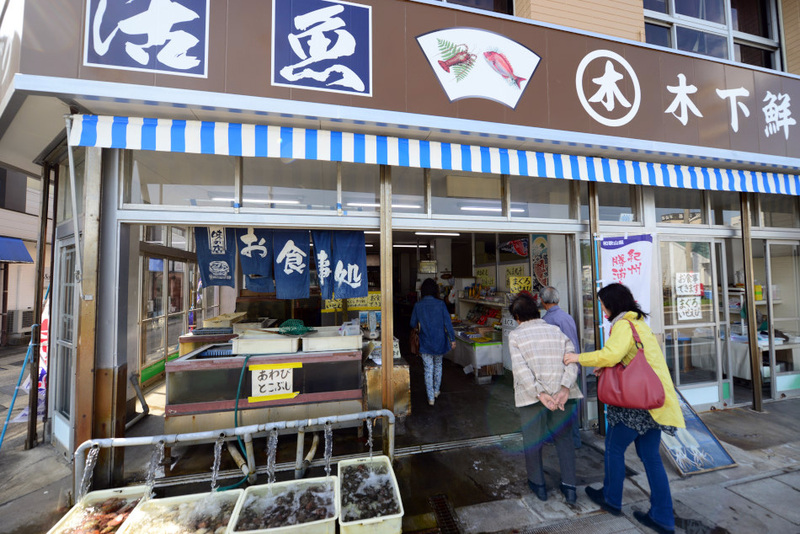 It is a fishmonger doubled as a seafood restaurant. Display of catches-of-the-day at the storefront attracted much attention of passersby. 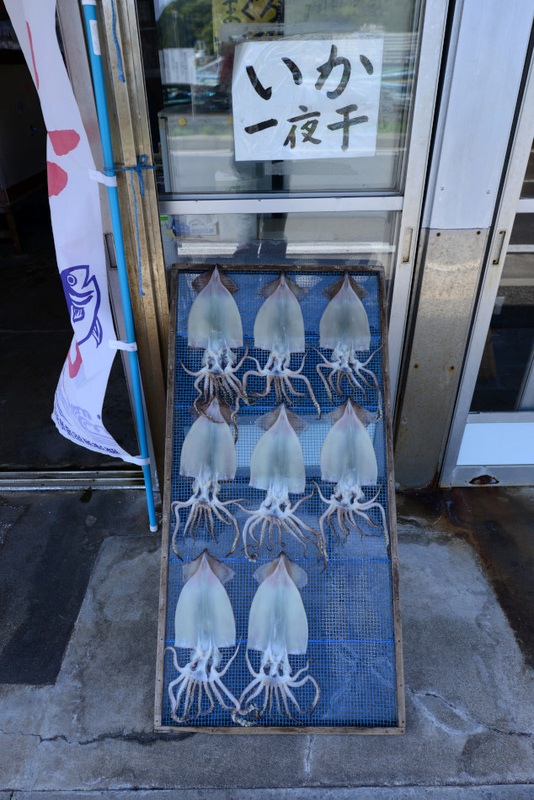 Sun-drying squids at the storefront. Inside the store at the far end, there was a seafood eatery with a few tables. 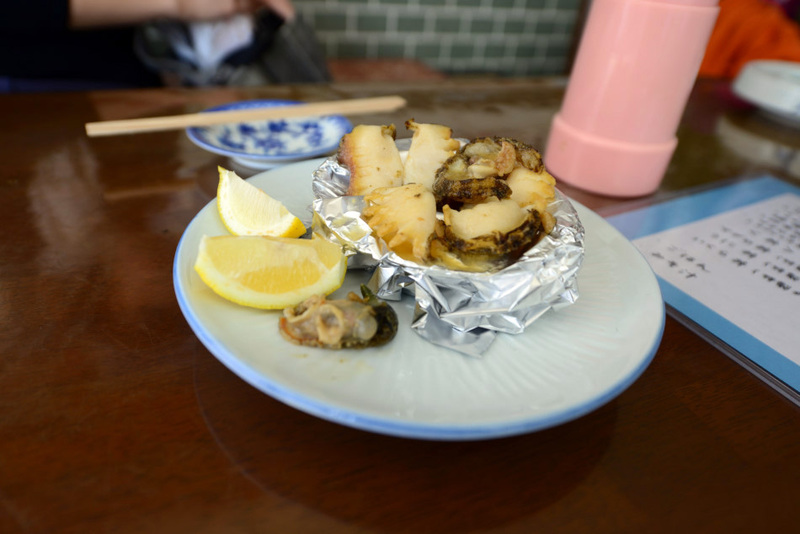 We were given a Japanese menu and we ordered a few tapas-like dishes such as this grilled abalone topped with butter sauce. 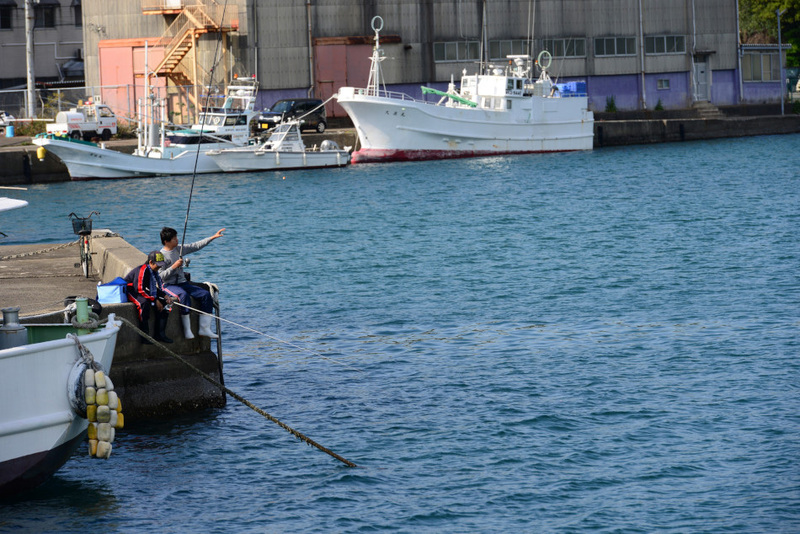 Along the shore, fishermen were drying seaweed under the sun, adding a fresh and aromatic scent to the sea breeze. 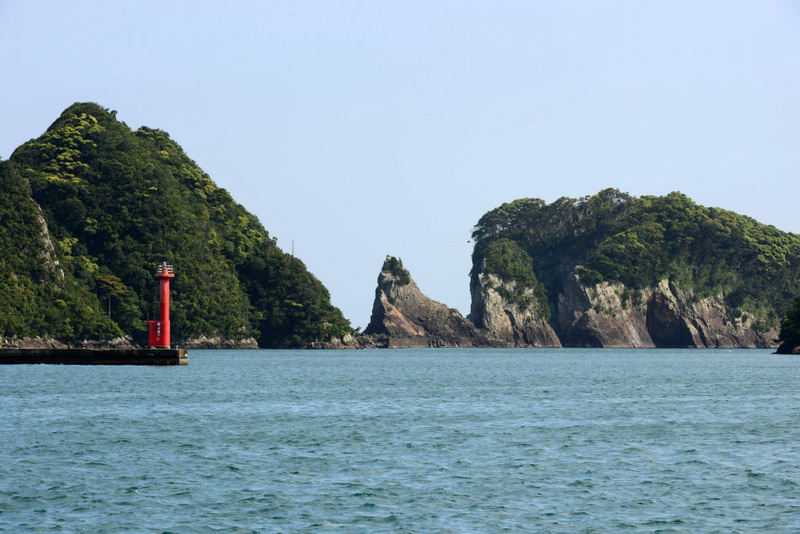 Each day, dozens of tour boats would venture out into the sea for sightseeing, as well as dolphin and whale watching. A group of eagles gathered at the pier probably looking for some “quick snacks” at the coastal water. 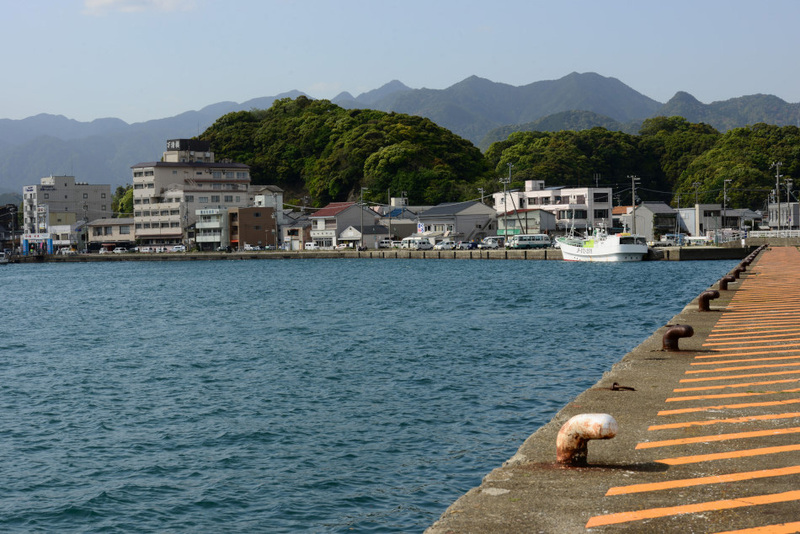 We walked out to the furthest pier and could see the Kii Mountain Range behind the town of Kii Katsuura. 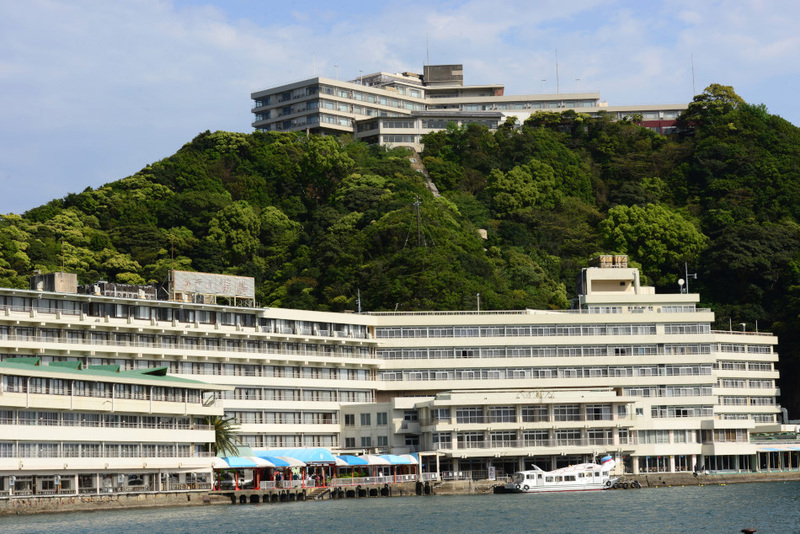 There are a number of mega resort hotels along the shore of Kii Katsuura. Some of which can only be accessed by boat. Parking at the front of this huge resort hotel was a passenger boat which transported hotel guests between the hotel and the main pier. Every time when the passenger boat arrived at the hotel, music would be played which could be heard miles away. 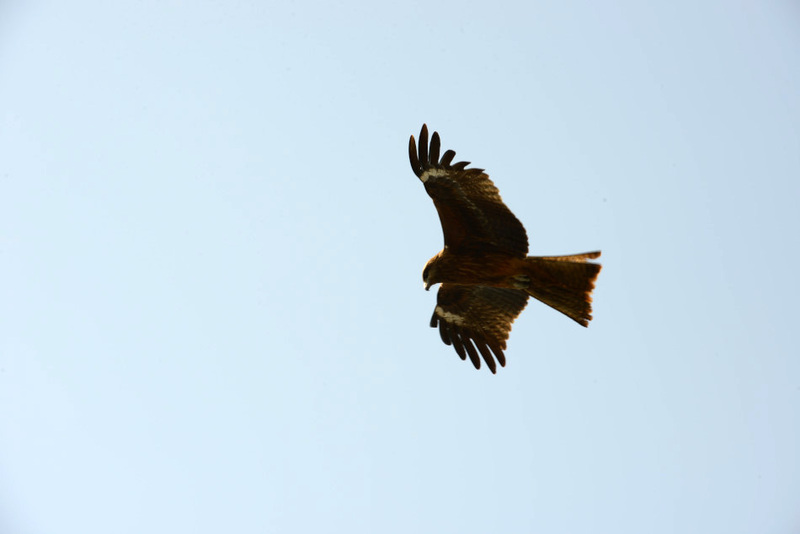 Many locals were trying their luck along the shore. 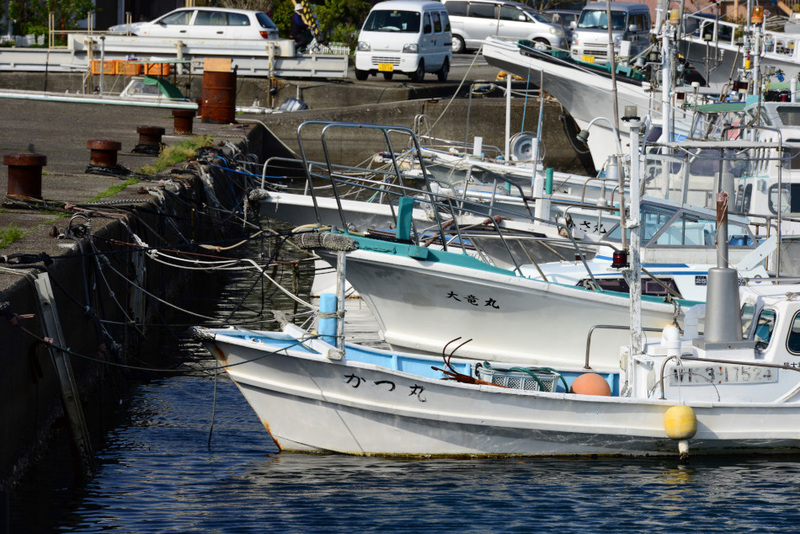 Fishing boats near the main pier. 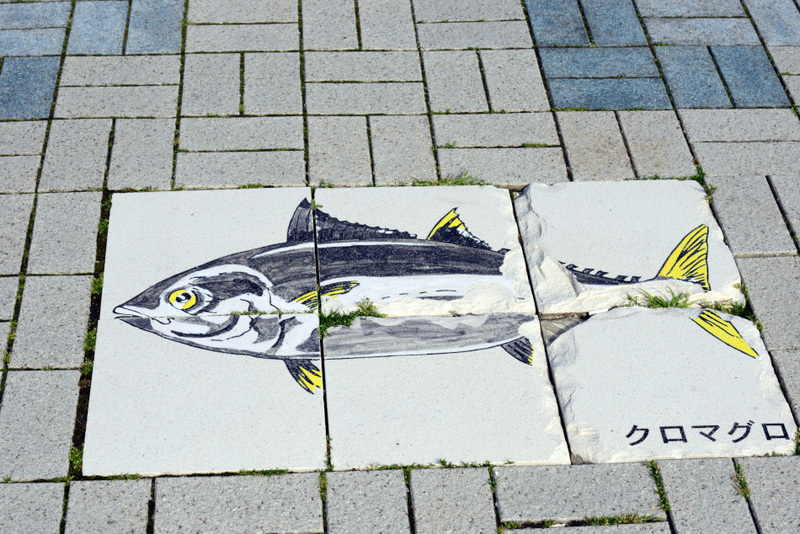 Even the floor tiles at the pier reminded us that fishing was the dominating industry in the region. 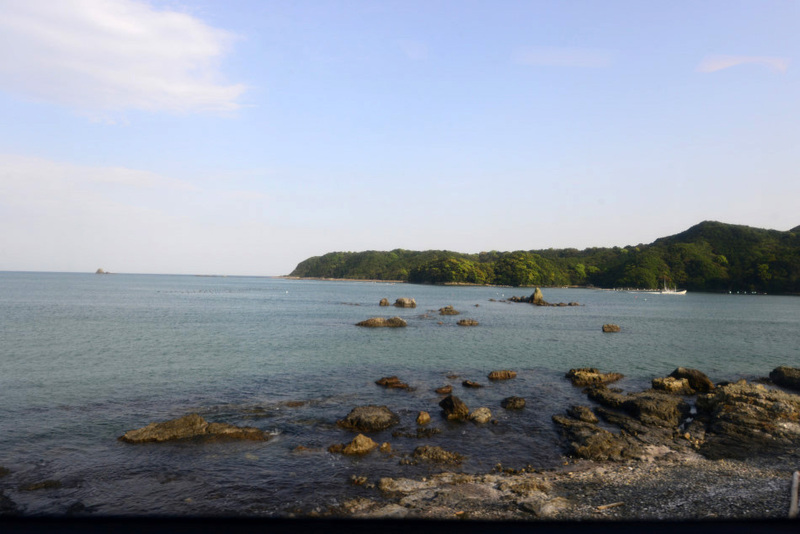 It was a scenic train ride along the coastline of the Kii Peninsula enroute to Osaka. The whole trip took about 3 hours and 40 minutes. 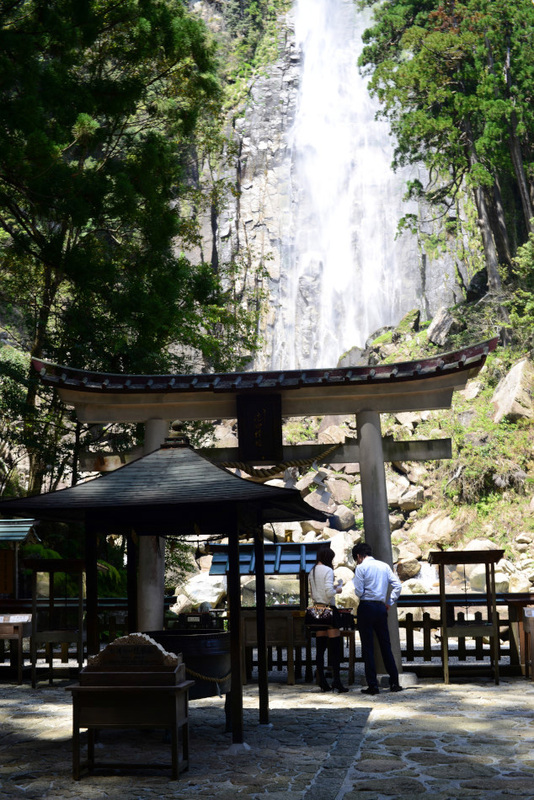 After we dropped off our bags at the train station of Kii Katsuura, we took a local bus up to Nachisan, where we would visit the famous Kumano Nachi Taisha, Seiganto-ji Temple and Nachi Waterfall. We arrived at Daimon-zaka, part of the old cobblestone pilgrim steps that leads up to the sacred Kumano Nachi Taisha, just before noontime. 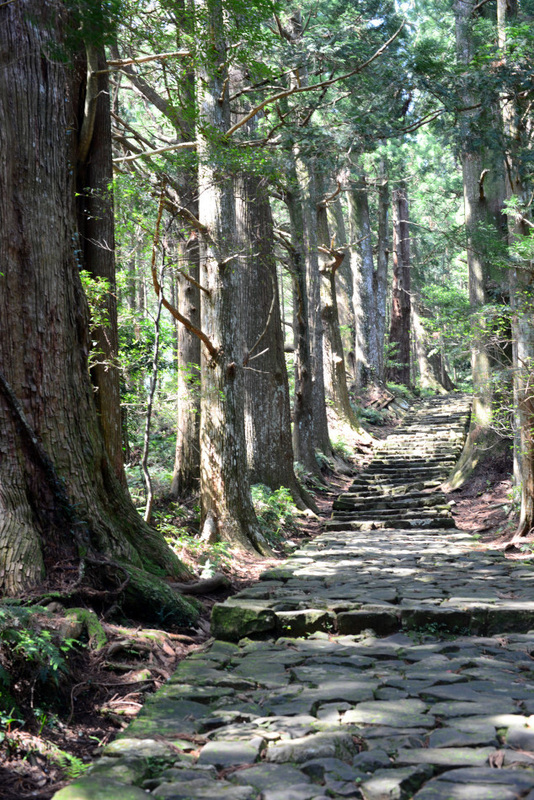 Flanked by old Japanese cedar trees and bamboo groves, the atmospheric Daimon-zaka was the last stretch of the old Kumano Kodo we hiked. 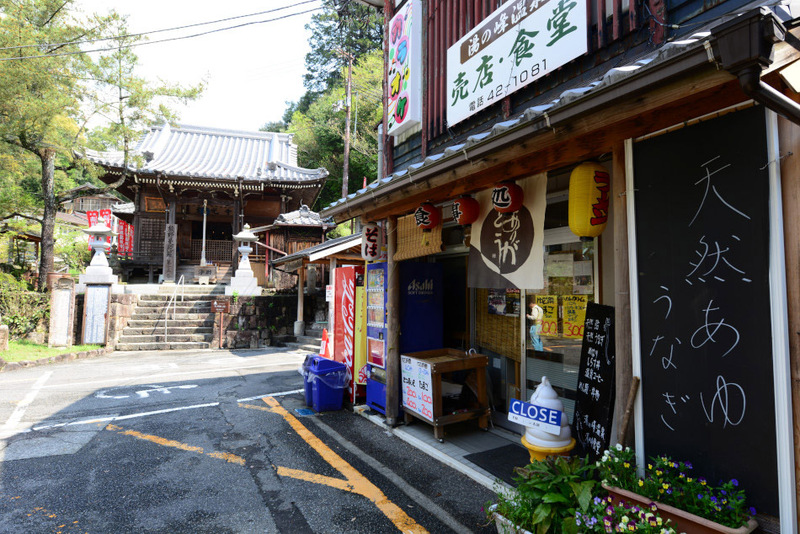 We walked on the Daimon-zaka for about half an hour before reaching the main uphill path that leads up to the temple site. 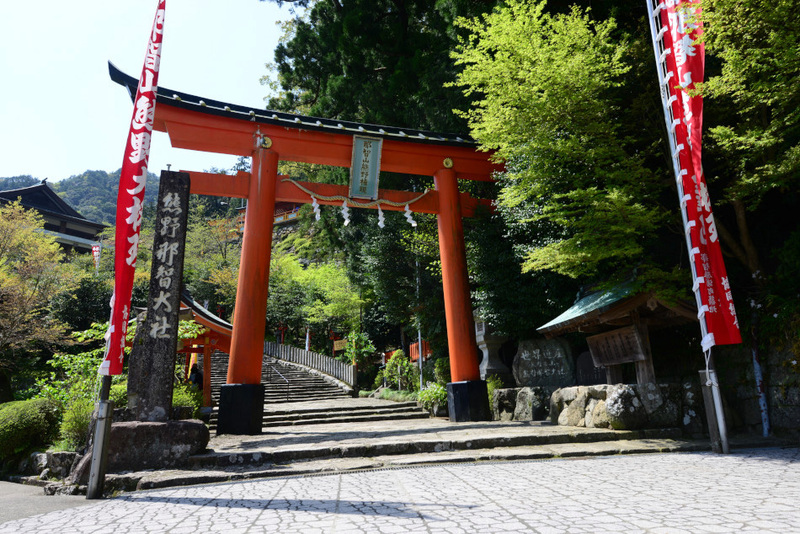 After some more steps and uphill paths, we found ourselves reaching the red torii gate of Kumano Nachi Taisha. The temple ground was packed with tourists, both local and foreign, all were drawn to here by the orange coloured shrine structures, and the iconic three-storey pagoda. The pagoda is part of Seiganto-ji Temple, a Buddhist temple that shares the same site of Kumano Nachi Taisha for centuries. 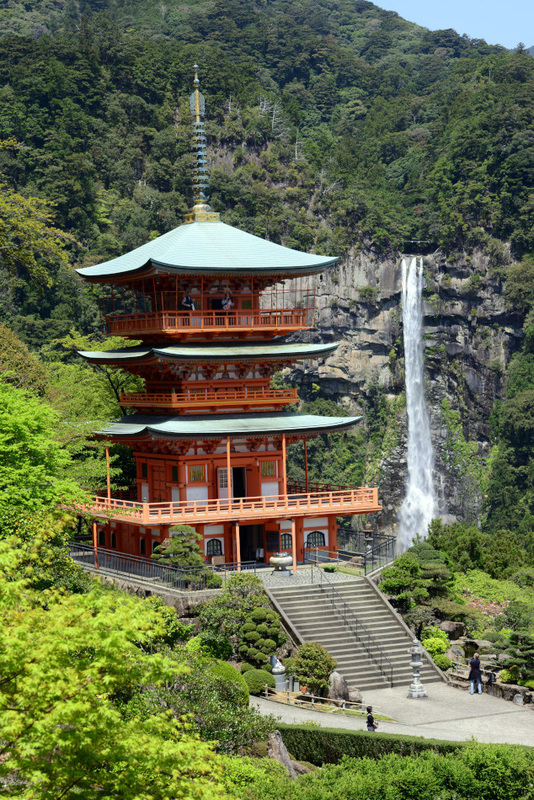 On the way walking to the pagoda, we passed by the most popular vista of Nachi Taisha: the orange pagoda in front of Nachi Waterfall (Nachi no Taki), the tallest waterfall in Japan at 133m. From the pagoda, it was another short hike to the base of the waterfall, where a small shrine and a viewing platform stood. We then took a bus back to Kii Katsuura. 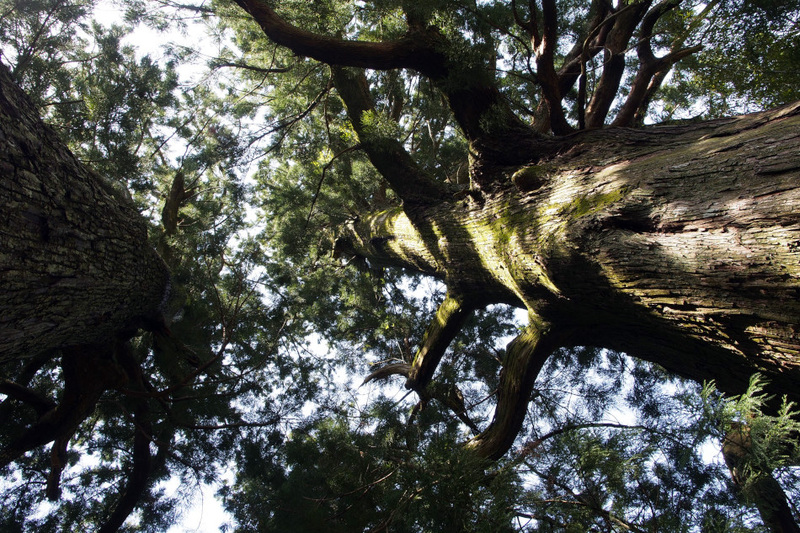 Centuries old Japanese cedar lined up along the path of Daimon-zaka. 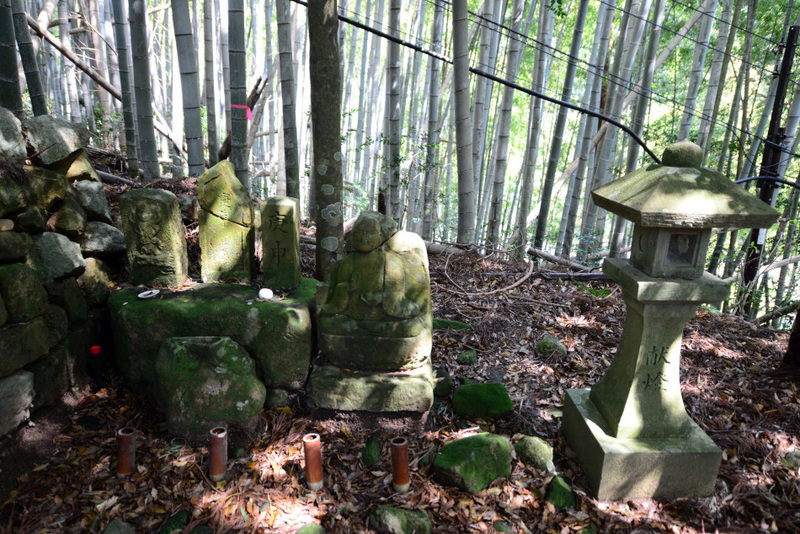 Along Daimon-zaka, small shrines and bamboo groves added a layer of mystical atmosphere. 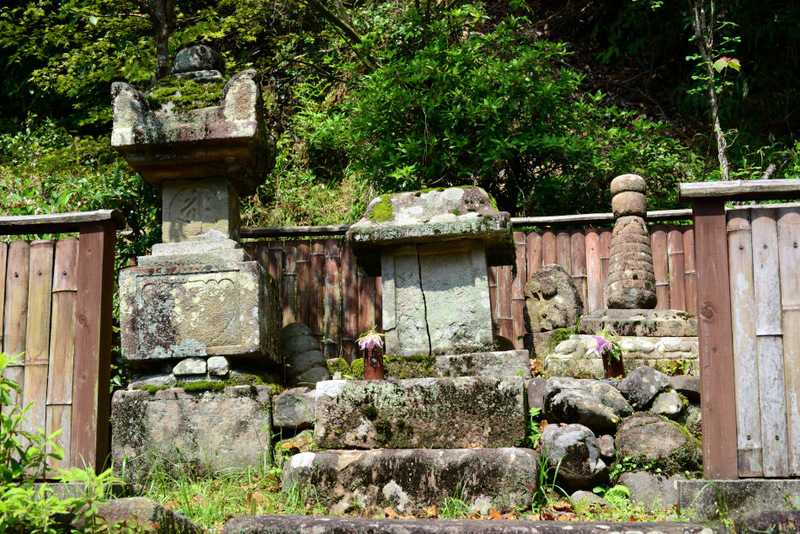 The stones of Daimon-zaka had witnessed centuries of pilgrims in and out of Nachisan. 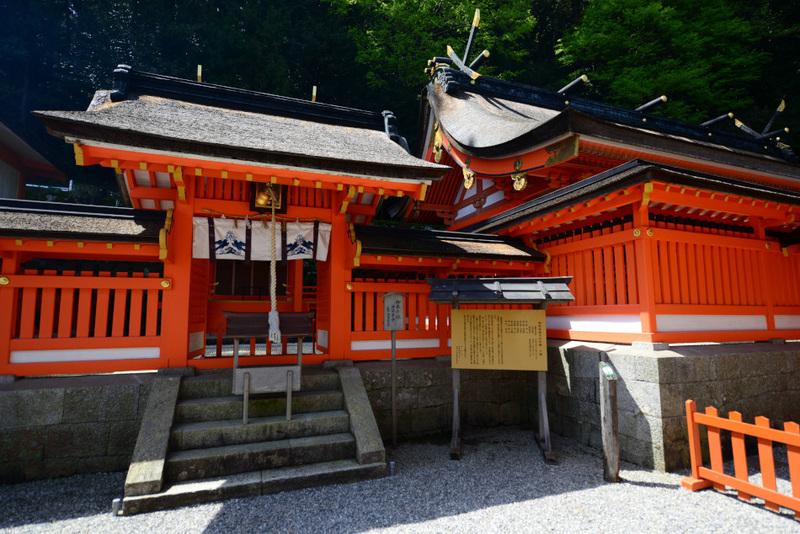 The orange torii of Nachi Taisha. 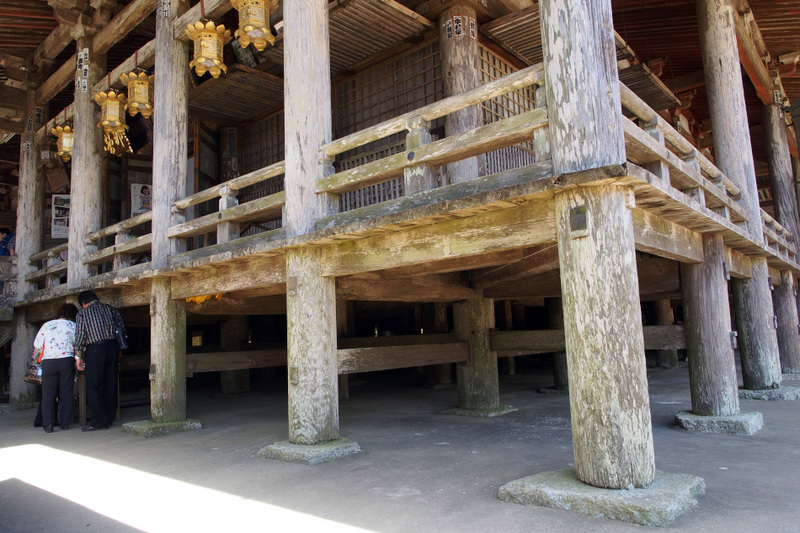 The shrine structure in the complex of Nachi Taisha. 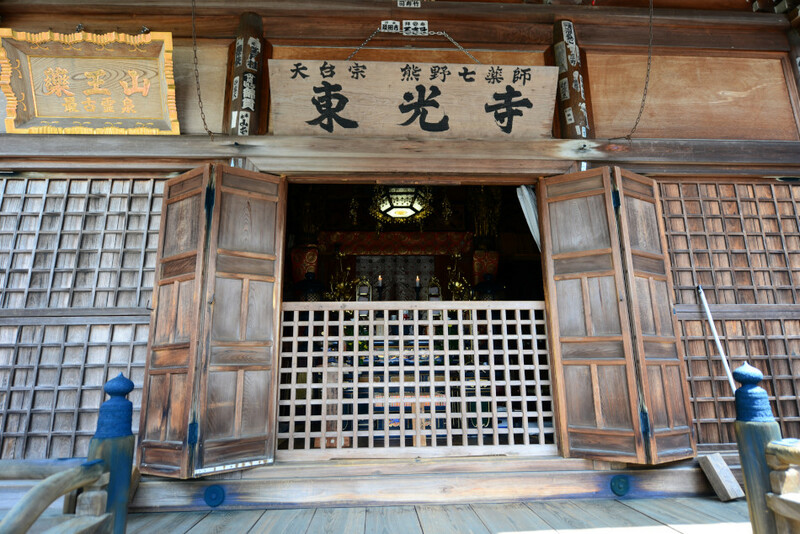 A main structure in the taisha complex. Little device for worshipers to make their wishes. 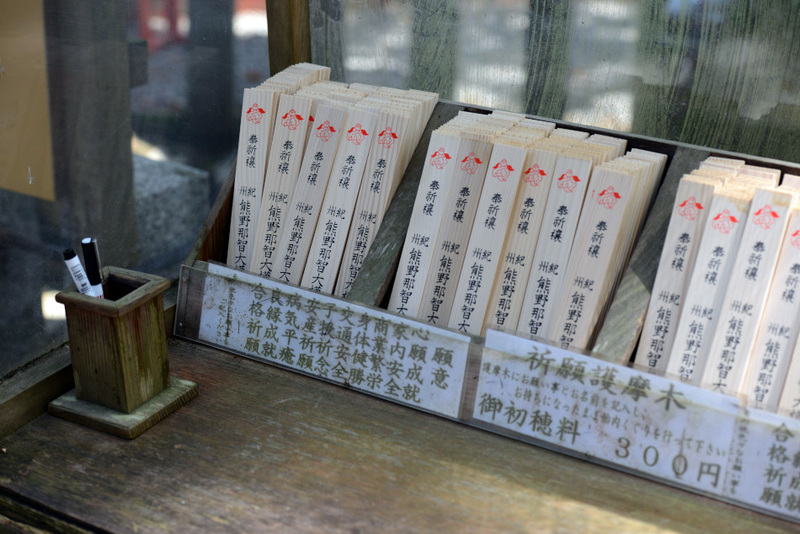 Small wooden plagues for worshipers to write down their wishes. 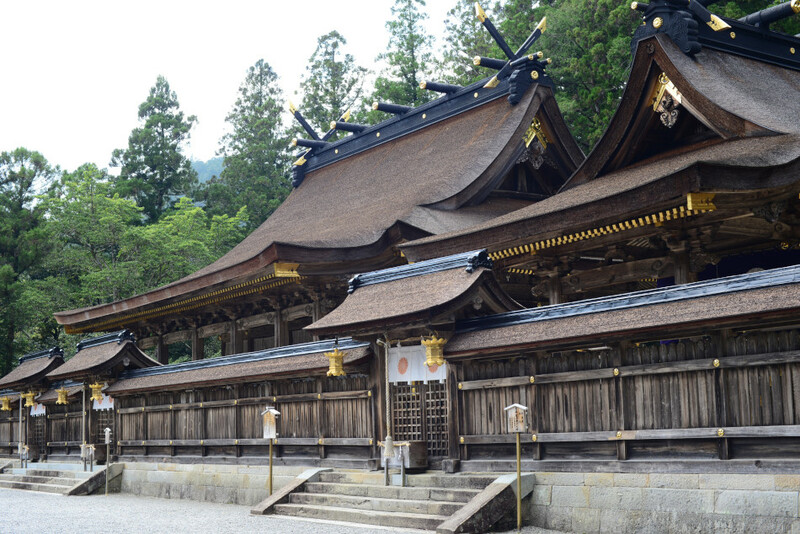 Seiganto-ji Temple, the Buddhist temple adjacent to the Kumano Nachi Taisha. Statue of a monk in front of Seiganto-ji Temple. The iconic pagoda behind Seiganto-ji, with Nachi Waterfall in the background. 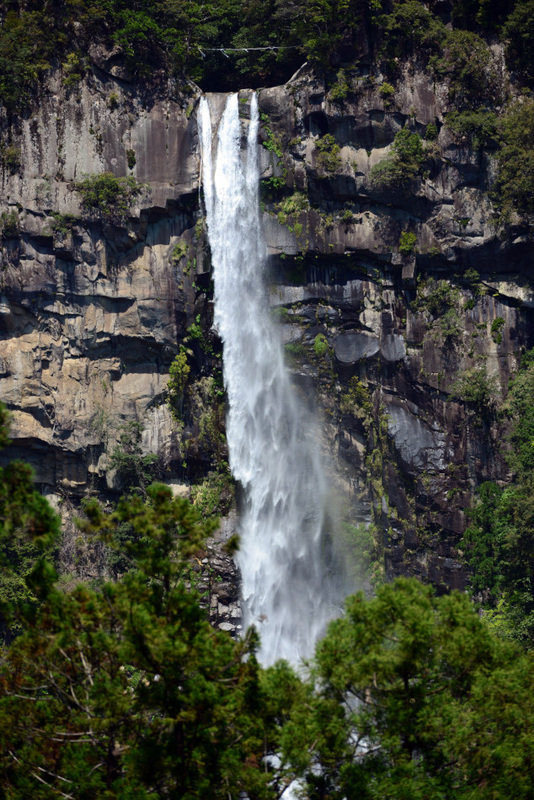 At 133m Nachi no Taki is the tallest waterfall in Japan. 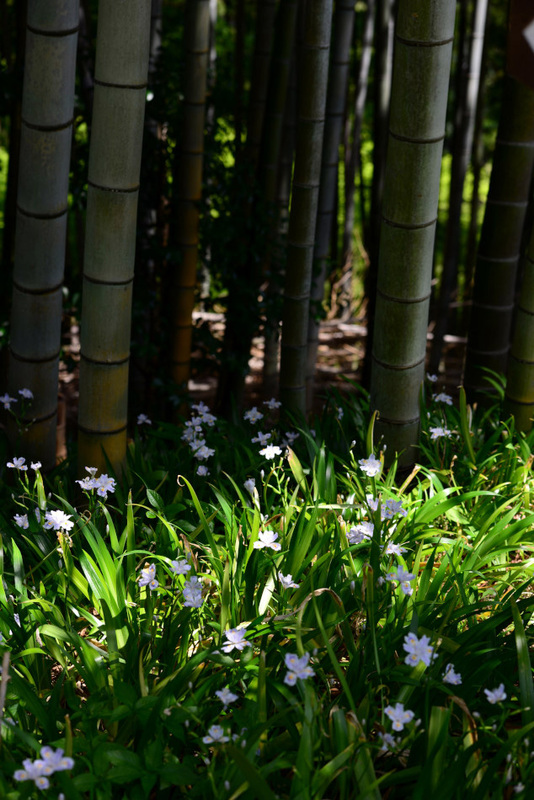 Wild flowers and bamboo groves along the way to the base of the waterfall. 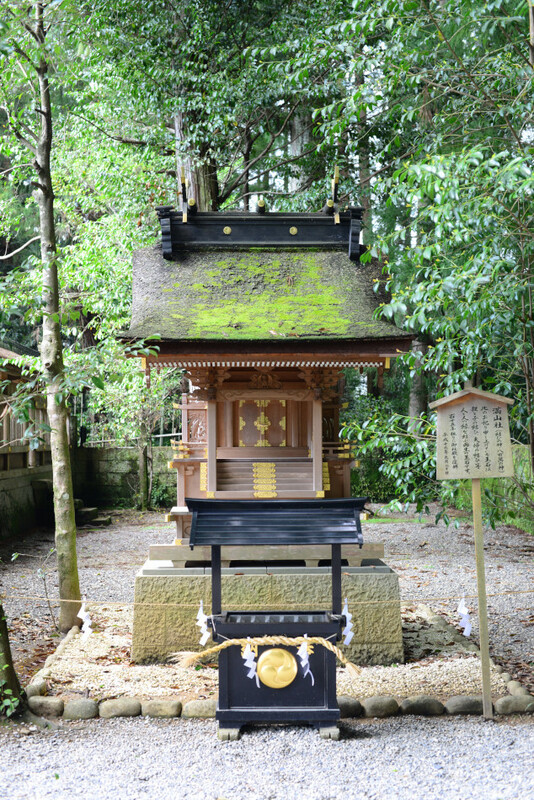 A small shrine at the base of Nachi no Taki. 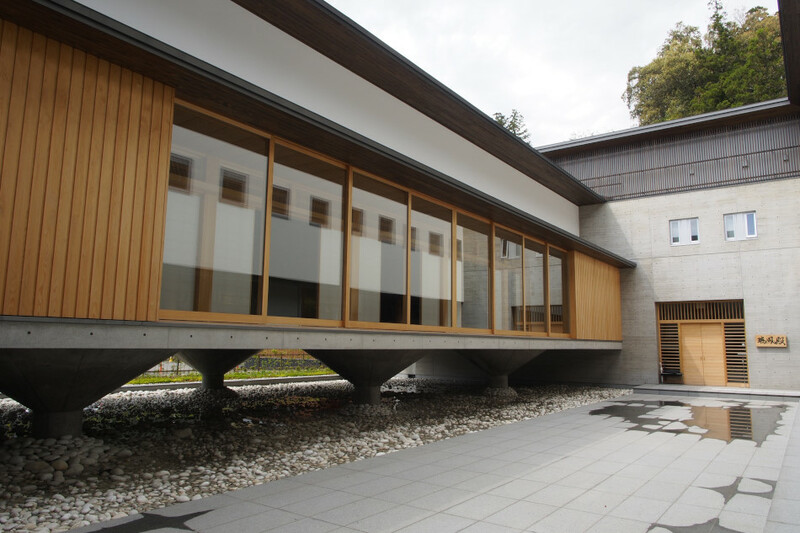 It was only a short bus ride from Hongu to Wataze Onsen, the hot spring hotel facility where we stayed the night. 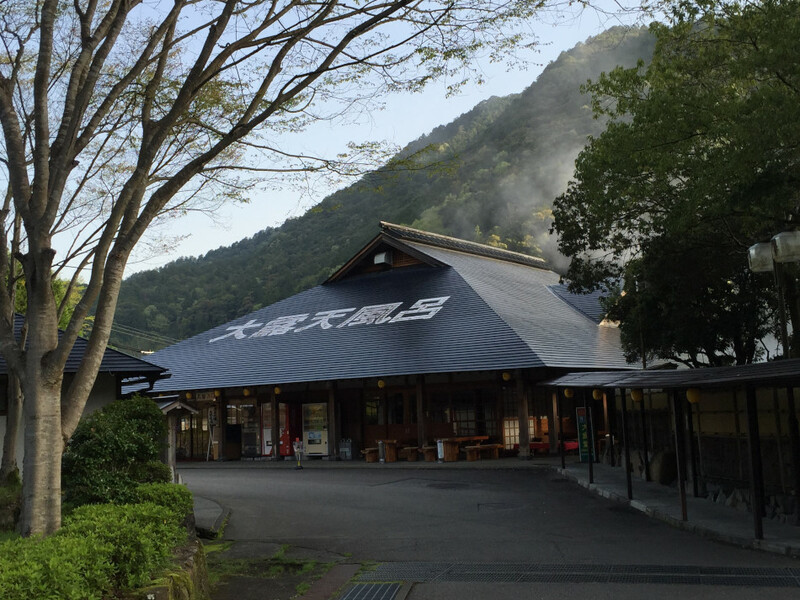 Wataze Onsen is famous for its outdoor hot spring bathing facilities, some of the largest in the region. 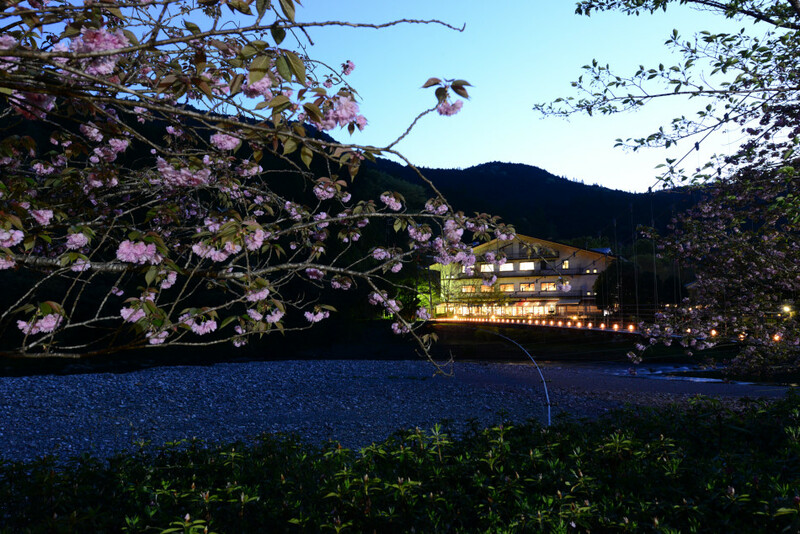 We had another relaxing evening at Watarase Onsen Hotel, a perfect getaway destination in the mountains. No foreign tourists could be seen at the outdoor onsen, however, the large hotel complex was decently filled with local visitors to stay the night and some day-trippers who came for the hot spring only. 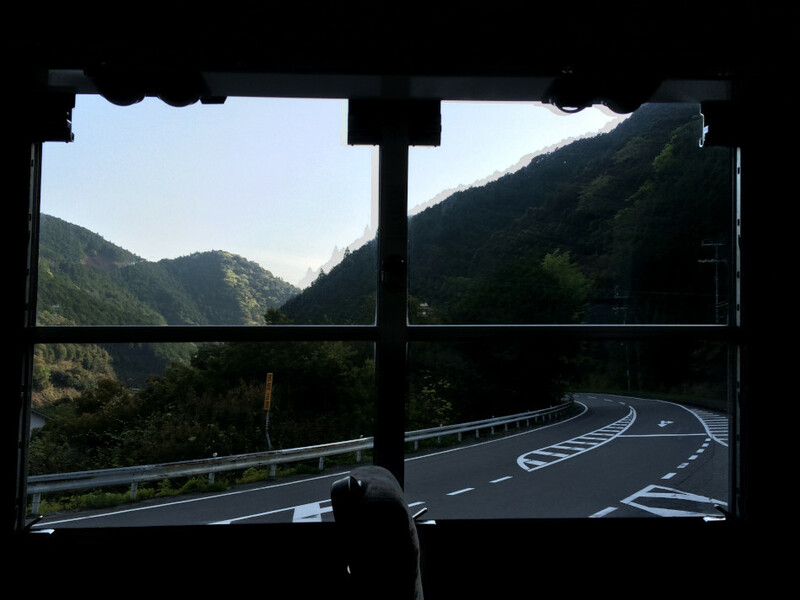 Bus ride to Wataze Onsen. 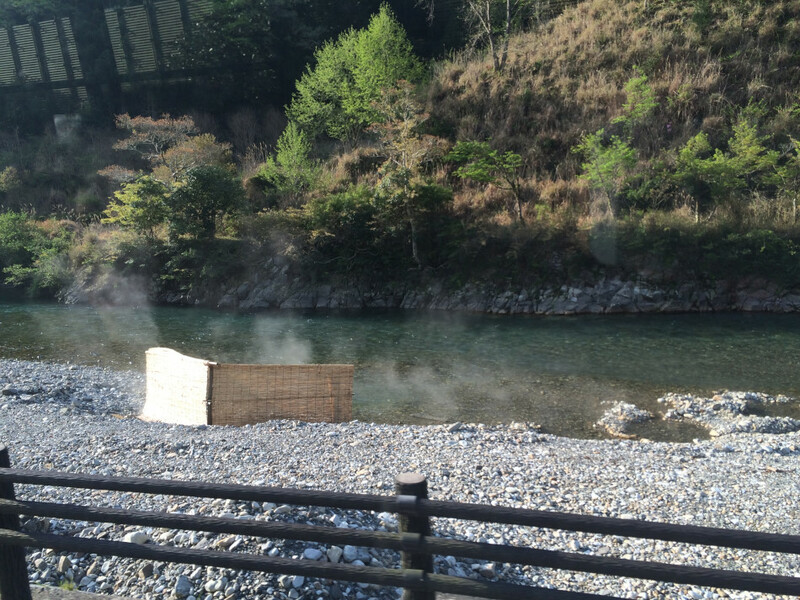 The bus passed by Kawayu Onsen, a special thermal spring where visitors can enjoy outdoor onsen by the river. Bamboo screens were set up along the stream for public use. 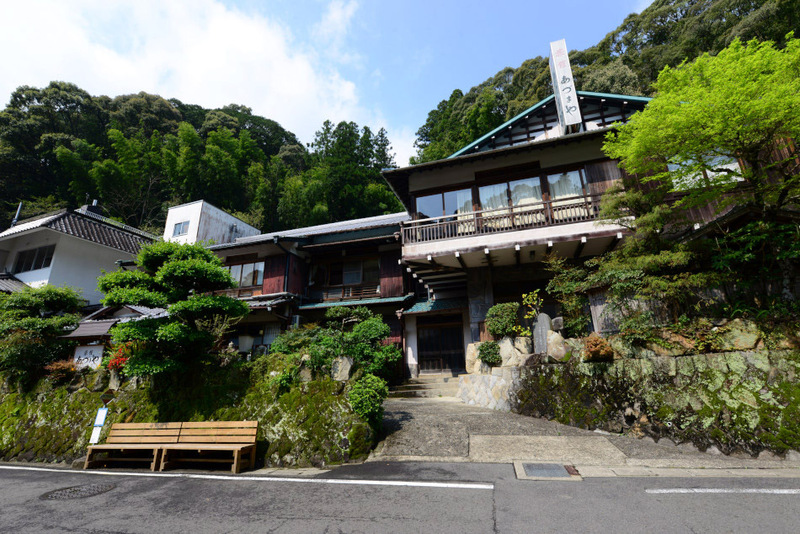 After getting off at Wataze Onsen, we found our way down to the main lodging facilities called Watarase Onsen. 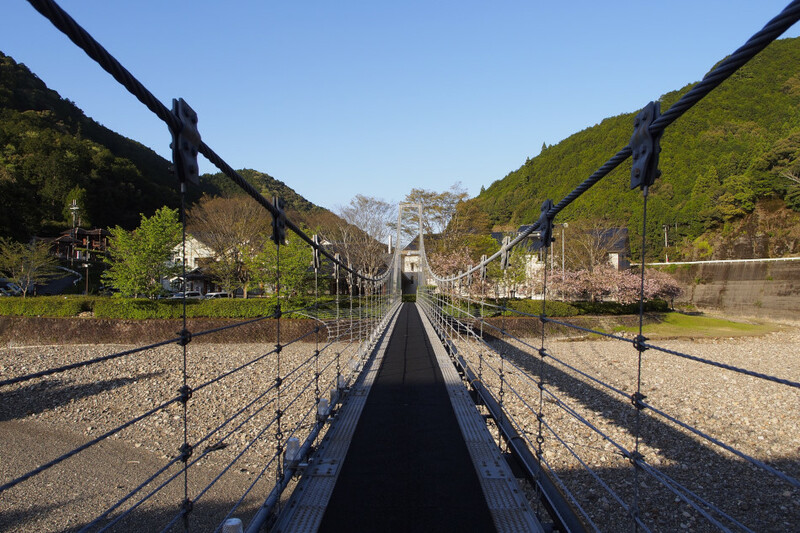 After crossing a suspended bridge we finally reached the main door of the hot spring hotel. 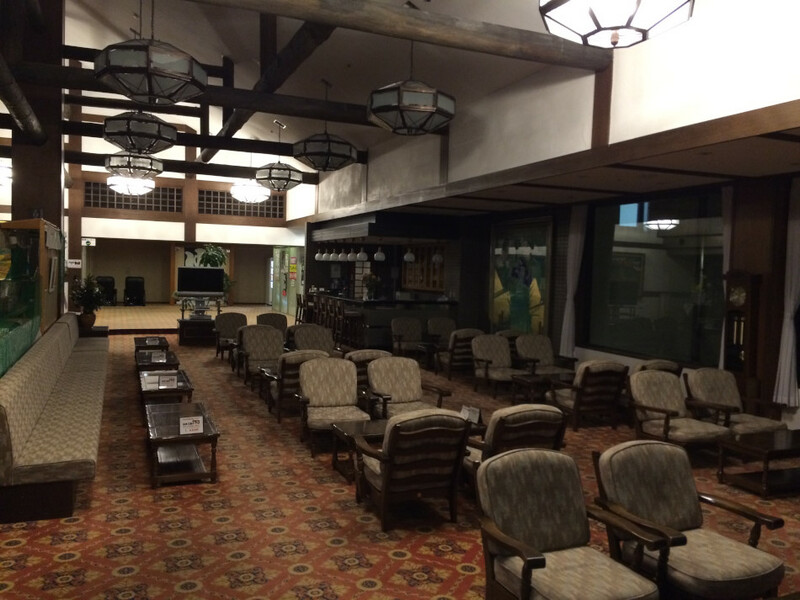 The main lobby of Watarase Onsen Hotel. 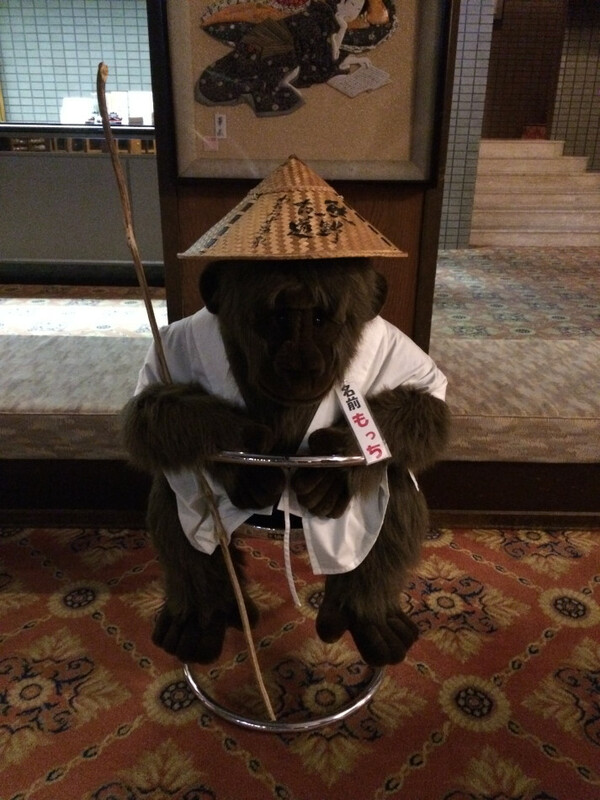 A pilgrim monkey of Kumano Kodo at the hotel lobby. 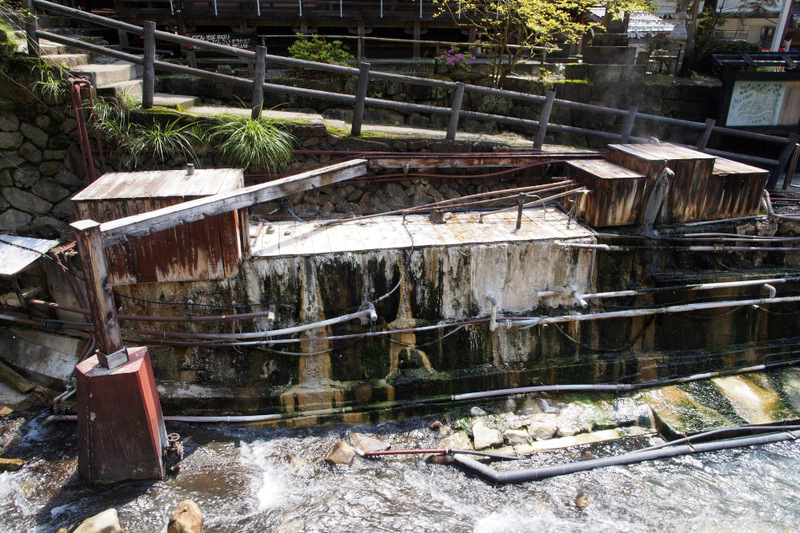 The rotenburo (outdoor hot spring bath) of Wataze Onsen is one of the largest in West Japan. The facility includes separate outdoor pools for male and female, as well as several family pools. After bathing in the hot spring, we enjoyed a decent kaiseki-royori (traditional multi-course Japanese dinner) at the Watarase hotel. 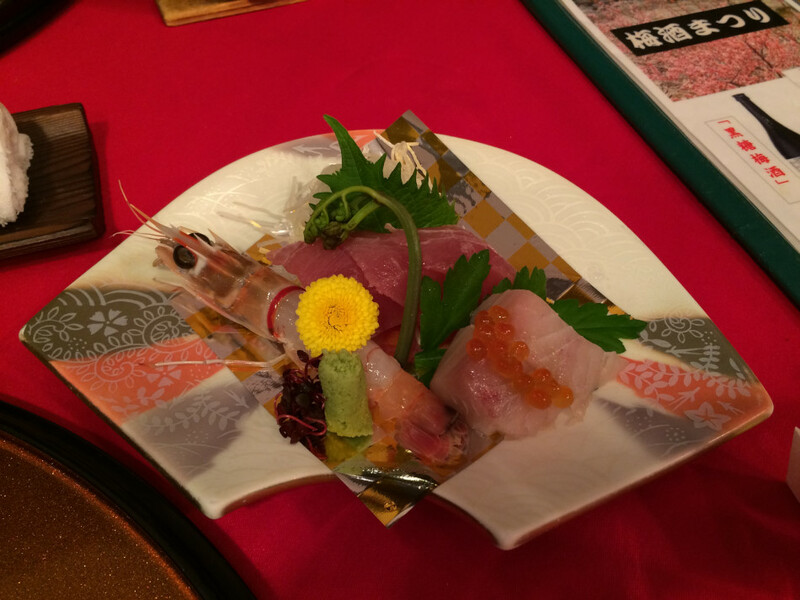 This fresh assorted sashimi was served as appetizer. 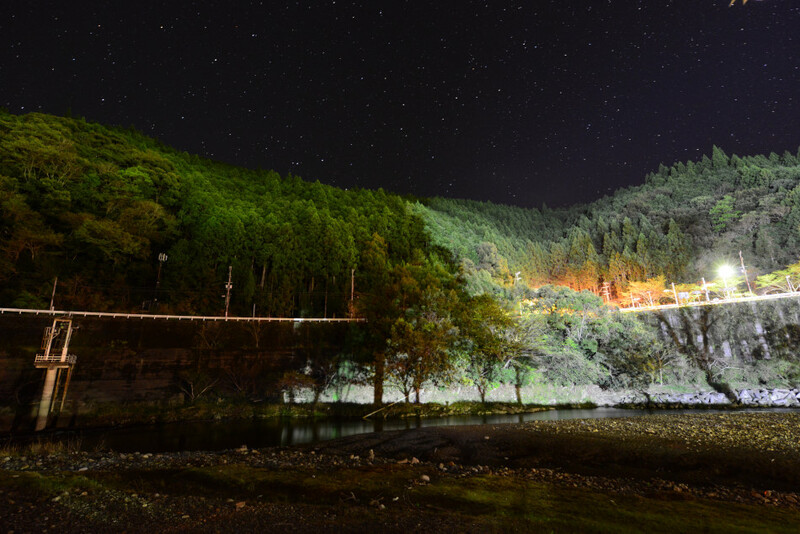 The Watarase Onsen complex include lodging and bathing facilities along both sides of the river, connected by a suspended bridge. 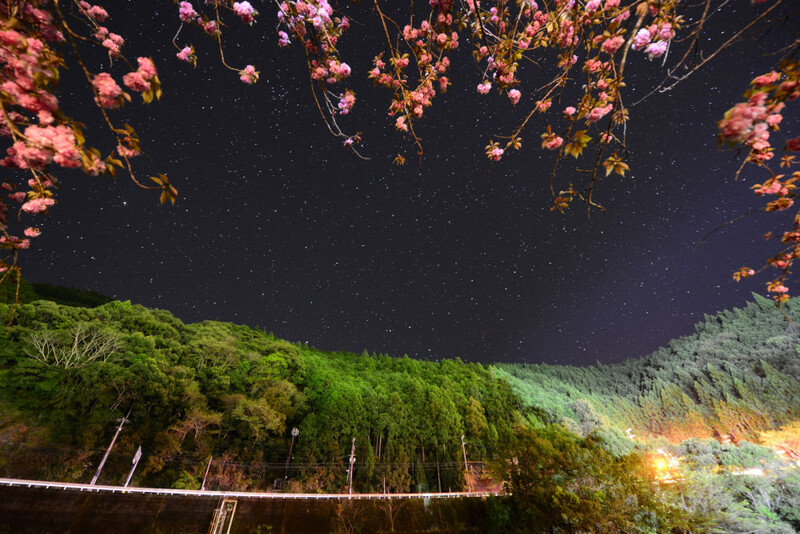 After the kaiseki dinner, we took a stroll under the starry night. 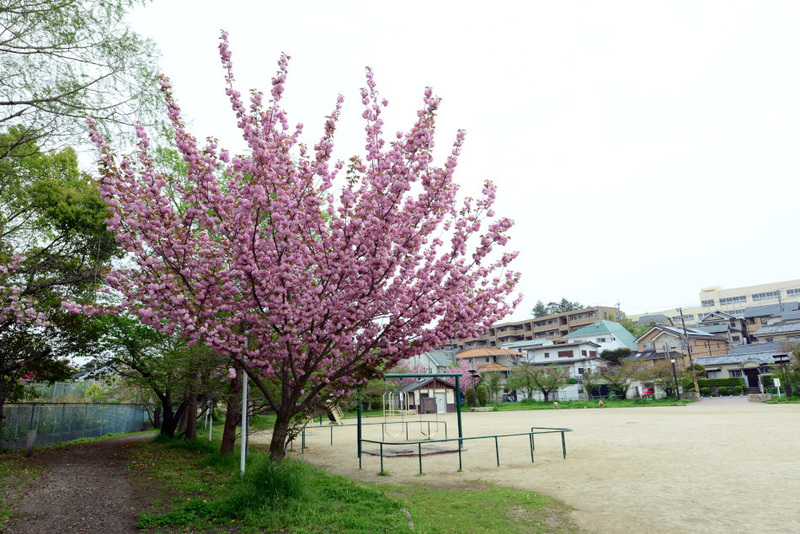 The cherry trees at Watarase Onsen Hotel were still in full bloom. 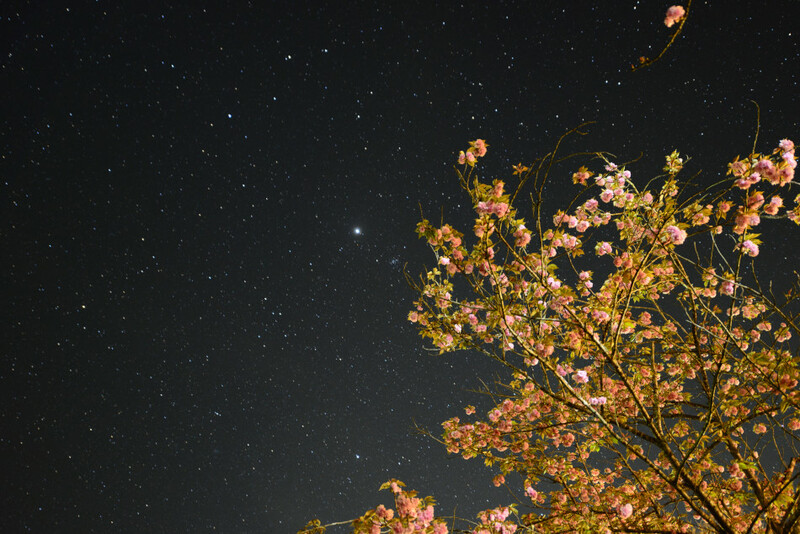 It was a peaceful evening with cherry blossoms against the starry sky. The next morning, we put on our backpacks again and crossed the suspended bridge one last time towards the bus stop. 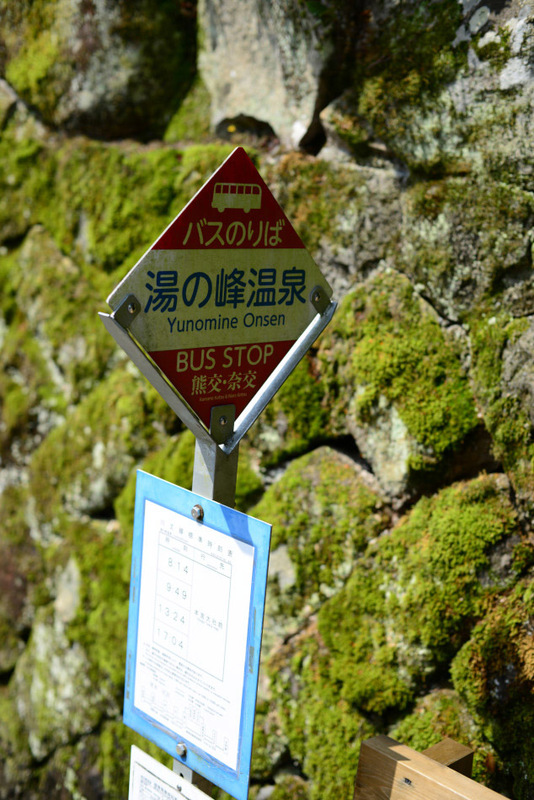 At Watarase Onsen bus stop we waited for the early morning bus that would take us to Kii Katsuura. 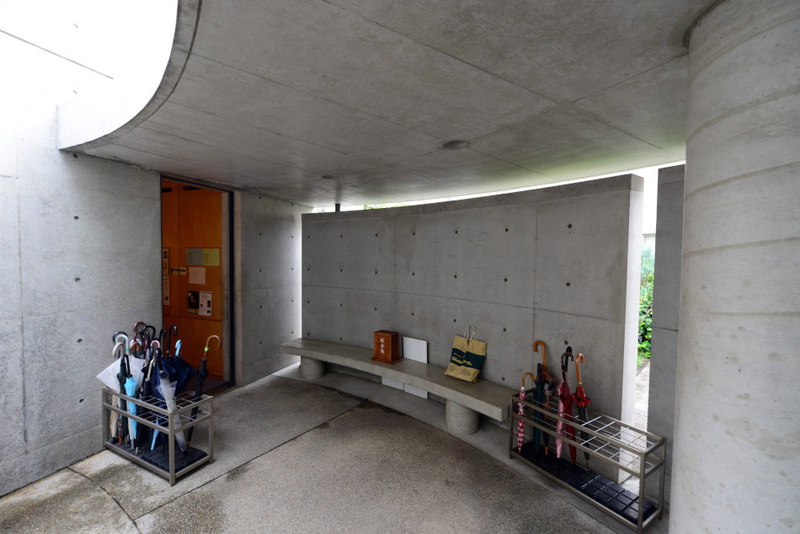 We would then store our bags in lockers and switch bus for a visit to Nachisan and the Nachi Taisha, one of the three main Kumano grand shrines after Kumano Hongu Taisha. 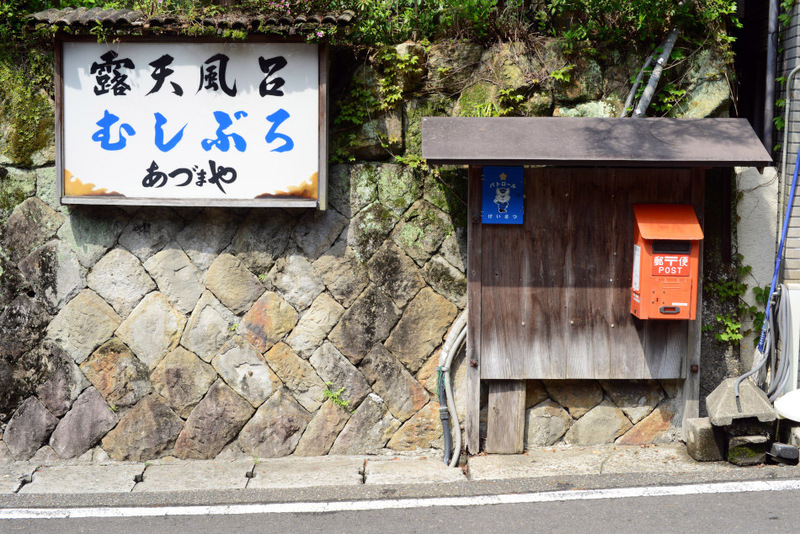 At Hongu, we dropped off our backpacks at a locker across the street from the main entrance of Kumano Hongu Taisha. 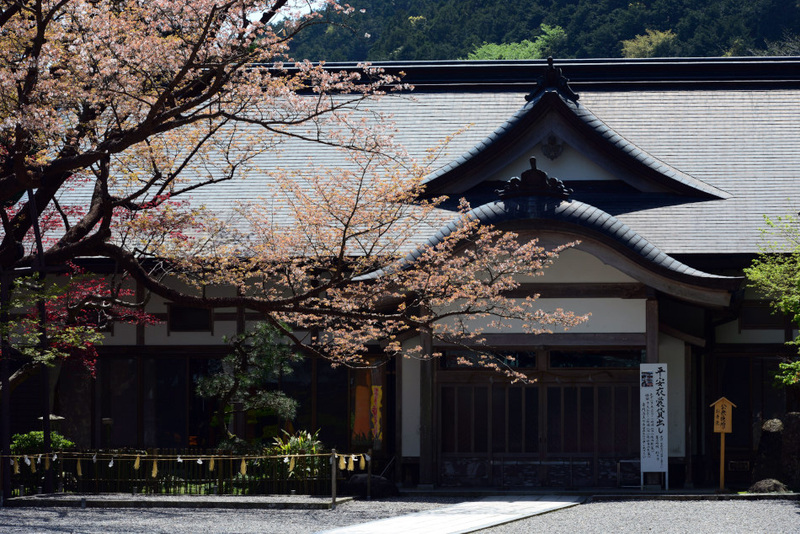 We then went to check out the heritage centre where we learnt a little more about the history of Kumano Hongu Grand Taisha and the Kii mountain range. 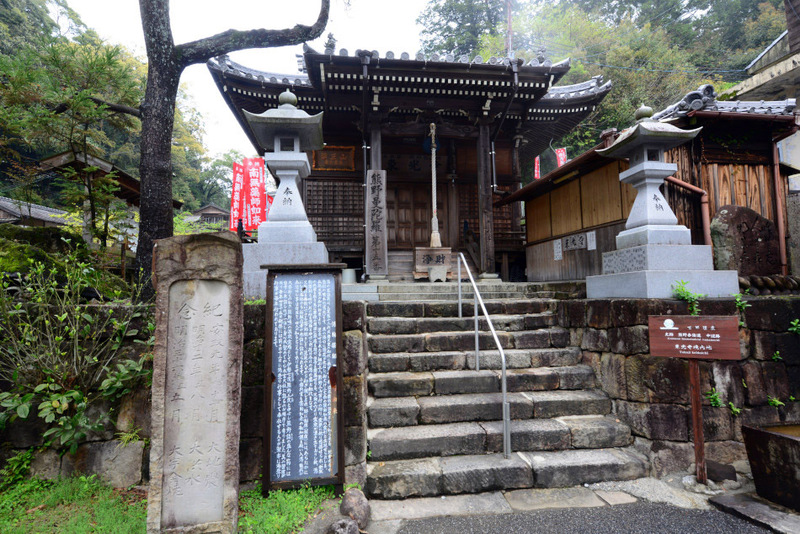 The Kumano Hongu Taisha is the house for the deity of Kumano Gongen, where pilgrims came to pay their respect to the deities of Kumano area for almost 1000 years. 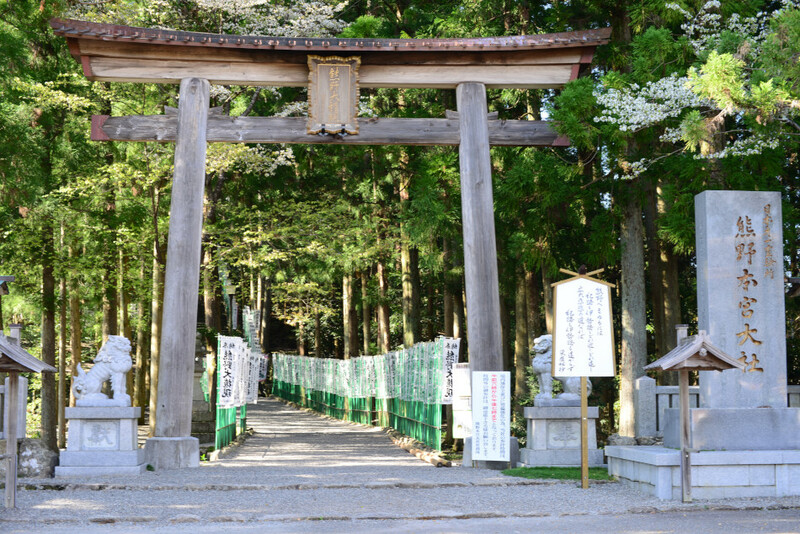 Every spring, the Kumano Hongu Taisha Spring Festival would take place with three days of ceremonies. On a bench outside of the centre, we took out the lunchboxes for a quick lunch. The yummy lunchboxes were ordered online before we left for our trip and delivered to our hotel at Yunomine in the morning. 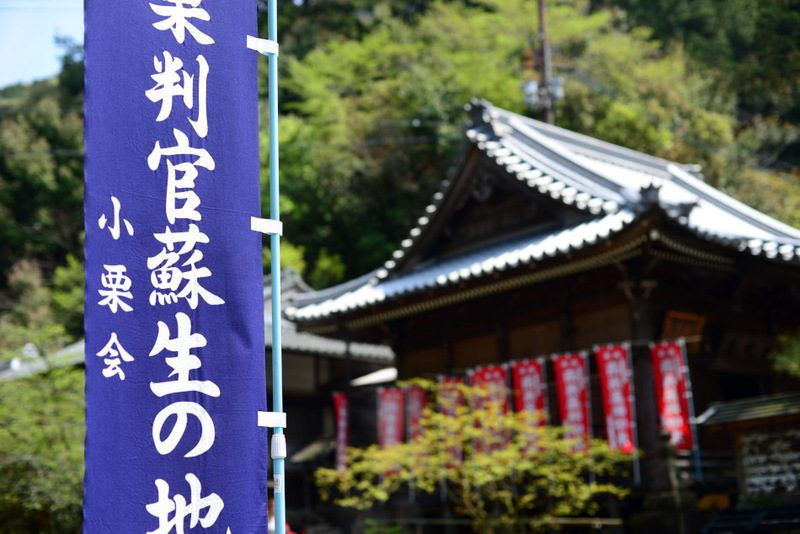 After lunch, we took our time to visit Kumano Hongu Taisha a second time. This time, we had more time to examine the donor lanterns, flags, signs, etc. along the main access path. After a relaxing stroll around the complex, we walked down the main entrance stairs one last time under the afternoon sun. 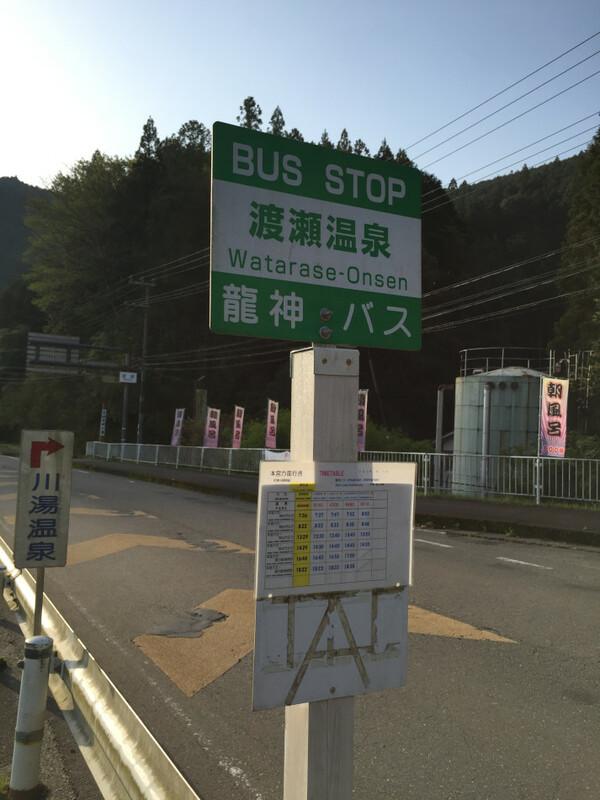 We picked up our backpacks at the locker and walked over to the bus stop in front of the heritage centre, where we would hop on a bus for Wataze Onsen. 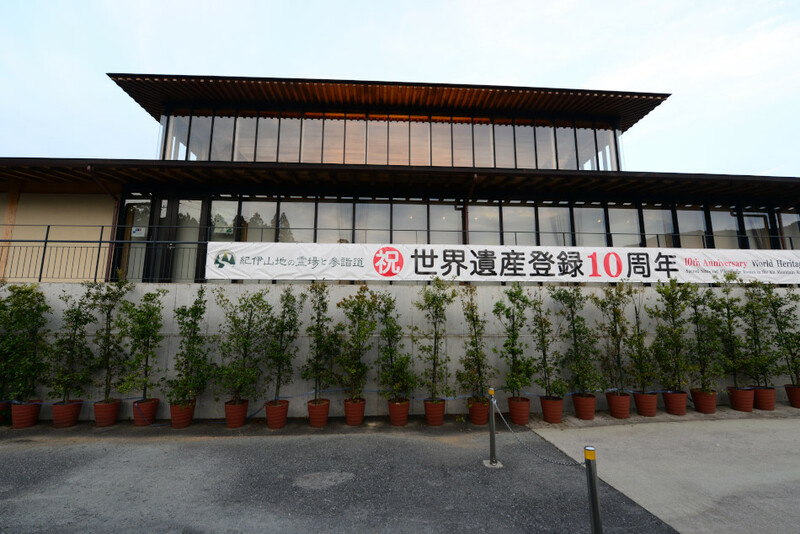 The banner at Kumano Hongu Heritage Center commemorated the 10th anniversary of inscription into UNESCO’s World Heritage for “Sacred Sites and Pilgrimage Routes in the Kii Mountain Range”. 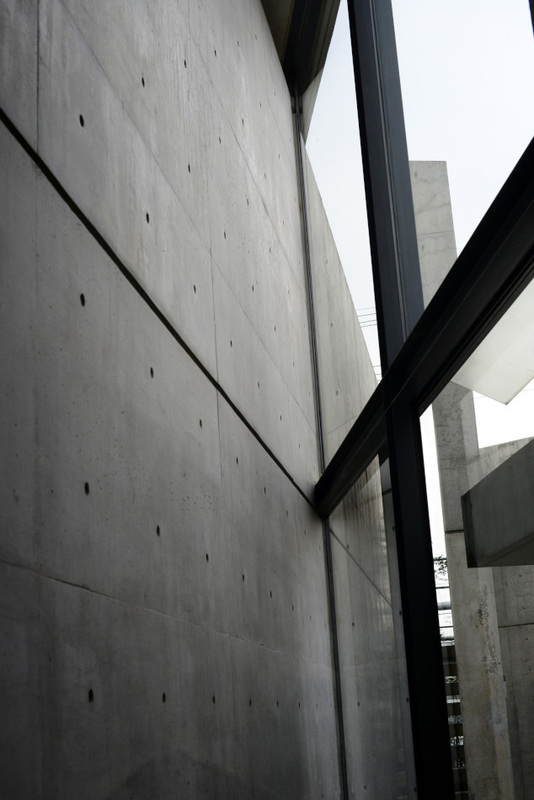 The Heritage Center represents a good example of modern architecture with a traditional touch. 33.9m tall and 42m wide, the Torii gate at the entrance to the sandbank of Oyunohara is the largest in the world. 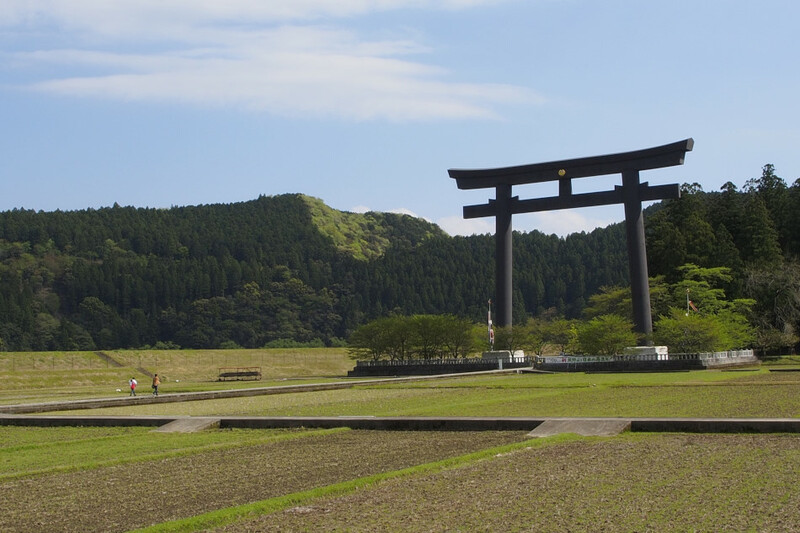 This is where the original Kumano Hongu Taisha stood over a century ago, before the devastating floods destroyed much of the old shrines. 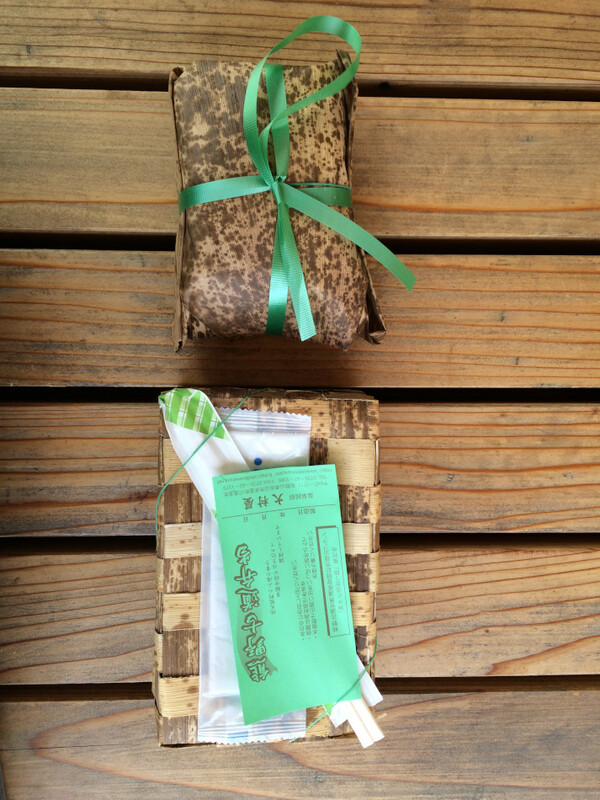 Along with our accommodation and luggage shuttle service, we also reserved this local lunchbox online at http://www.tb-kumano.jp prior our arrival in Japan. 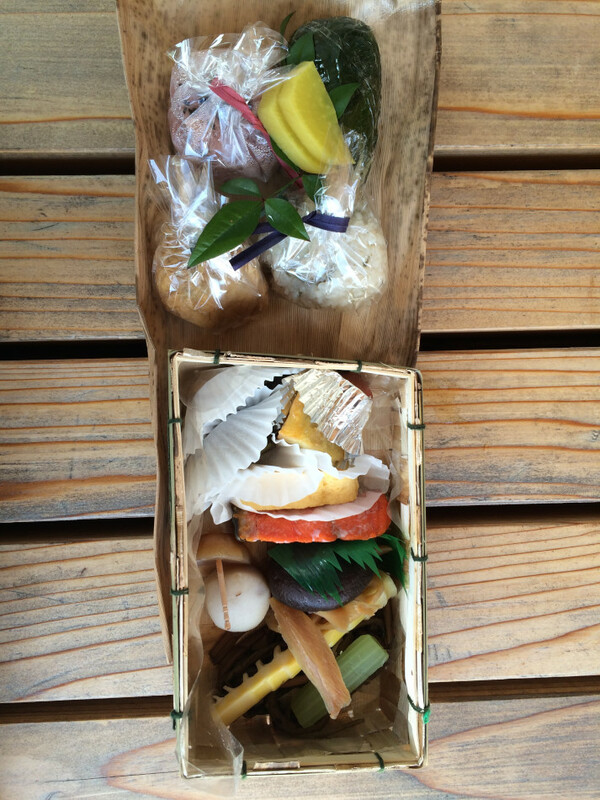 Housed in a bamboo box, our lunchbox contained a number of seasonal local delicacies. 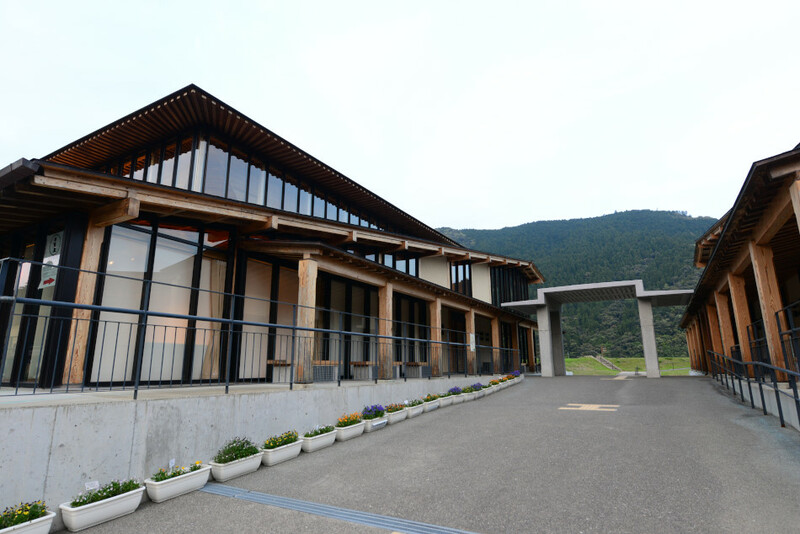 Rebuilt after flood damages, the Zuihouden next to the entrance of Kumano Hongu Taisha houses religious study areas, a hall and a souvenir shop. 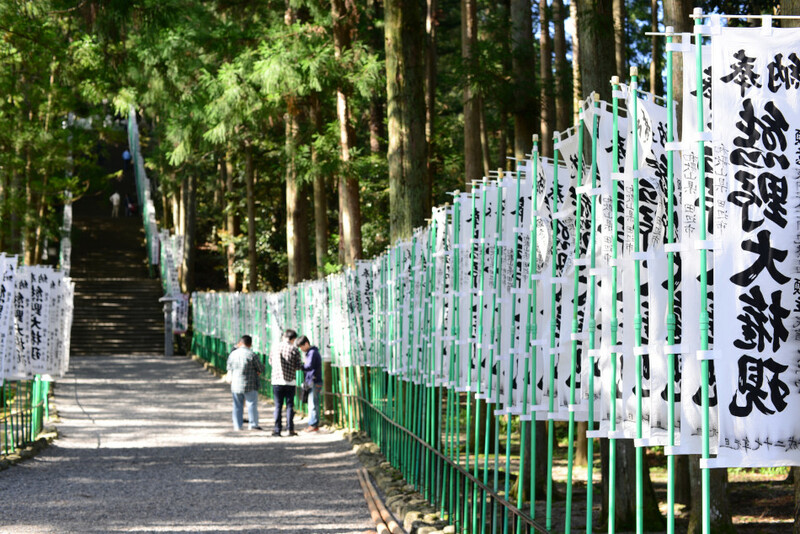 The stair leading up to the main shrine is flanked both sides with donor flags. 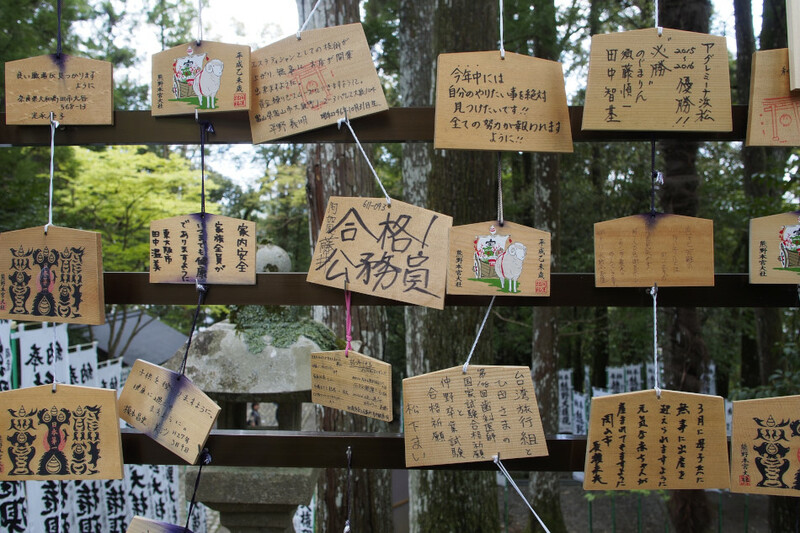 Worshipers put all kinds of wishes onto these wooden “ema” to communicate with the deities. 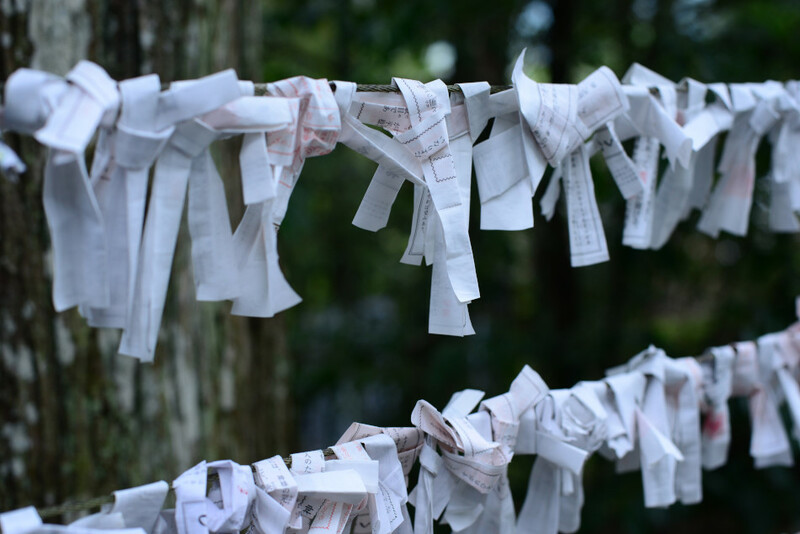 Tying the Omikuji, the fortune telling paper slips onto trees or ropes at the shrine is a common customs of worshiping. 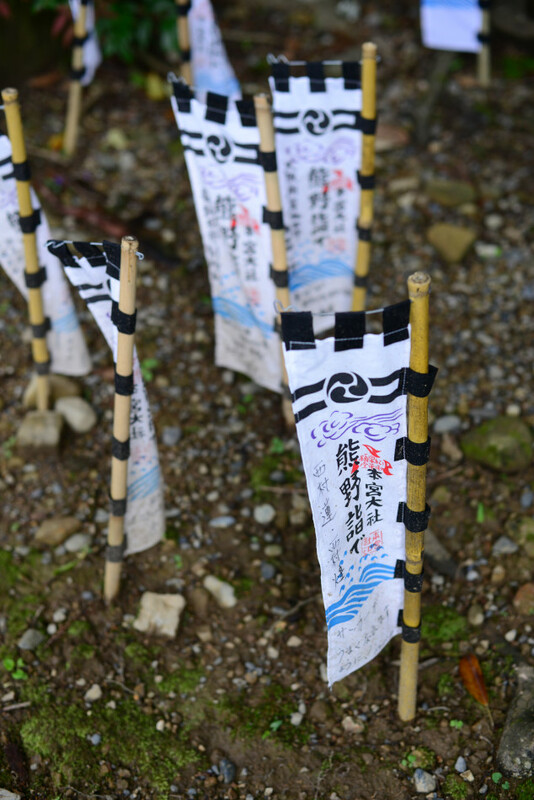 Small bamboo flags were another common option for worshipers to leave their messages. Before entering the complex, cleaning our hands at the purification trough had become a common practice even for foreign visitors like us. 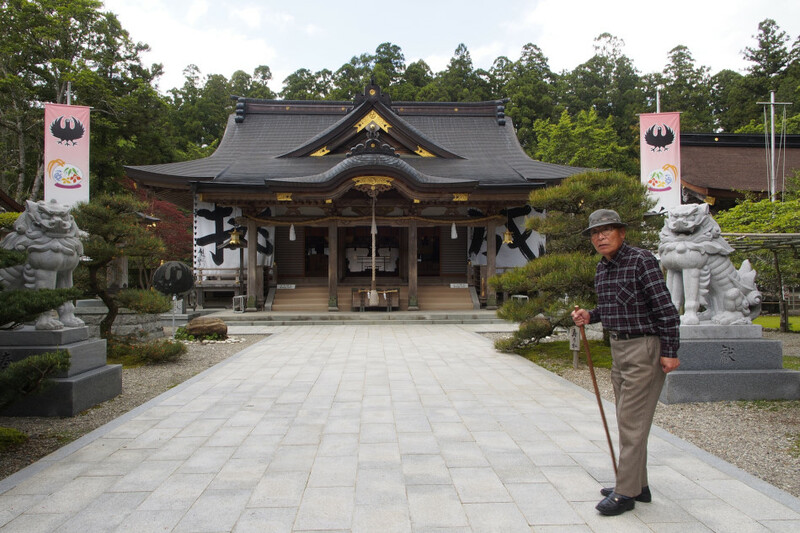 Wooden staff in hand, lots of elderly worshipers spend great effort in walking the pilgrim route before reaching Kumano Hongu Taisha. Our second visit to the Hongu Taisha. This time we had all the time we needed to wander around the complex. Beside the main shrines stood this small and popular shrine under tree shade. After a thorough visit, we walked down the main stair once again. 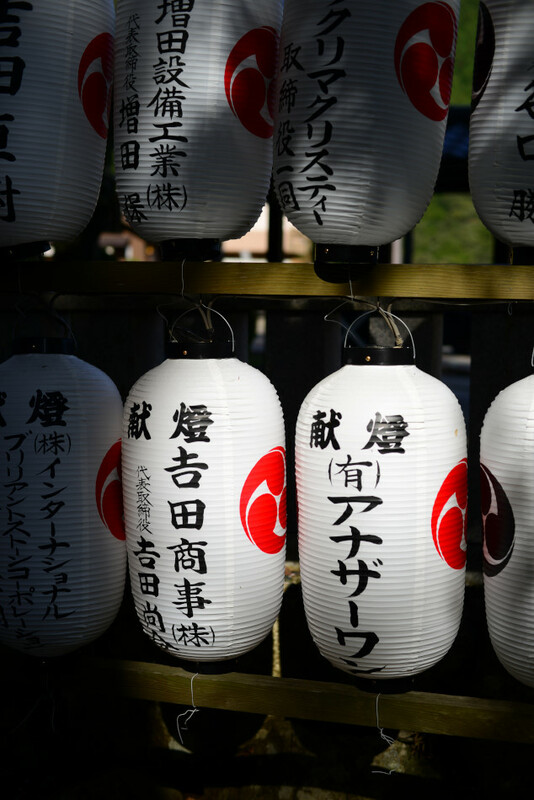 Lanterns with donor’s name were hung on a rack near the main gate of Kumano Hongu Taisha. We bid farewell to the Kumano Hongu Taisha under the late afternoon sun. 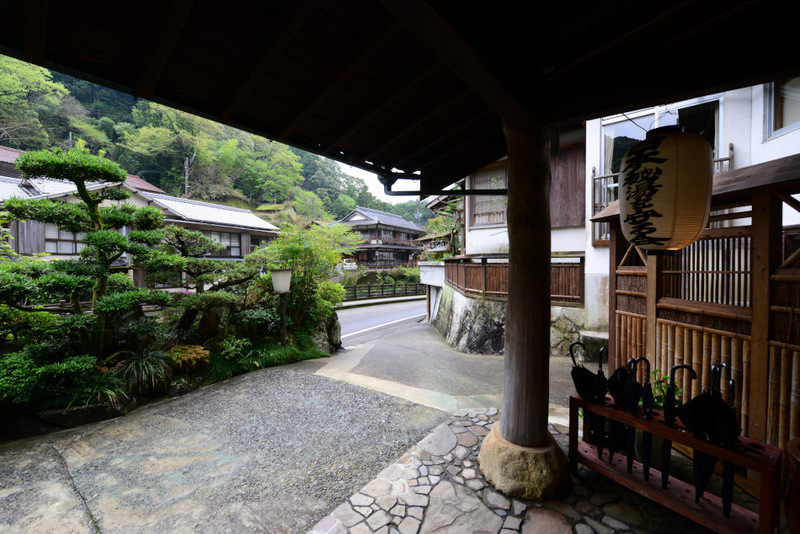 Since 1800 years ago, Yunomine has always been a popular onsen village in the Kii Mountains. 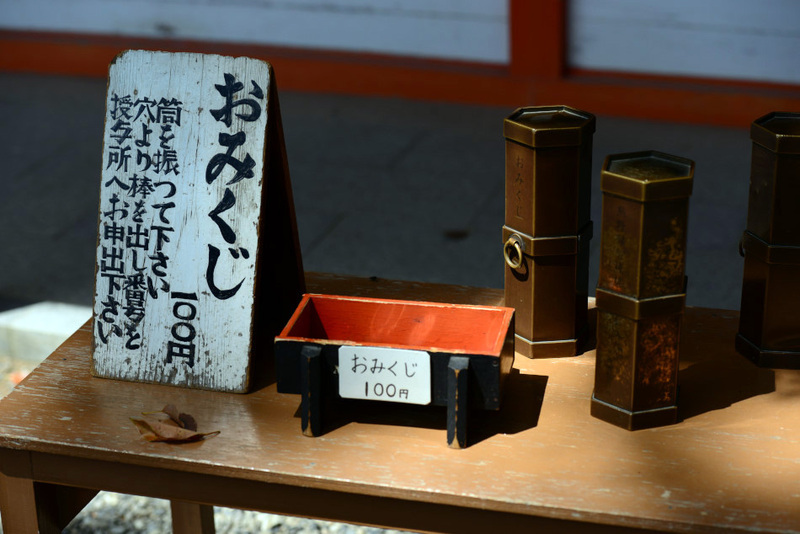 For centuries, its healing water offers a great reward for pilgrims after their visit to the Hongu Taisha. 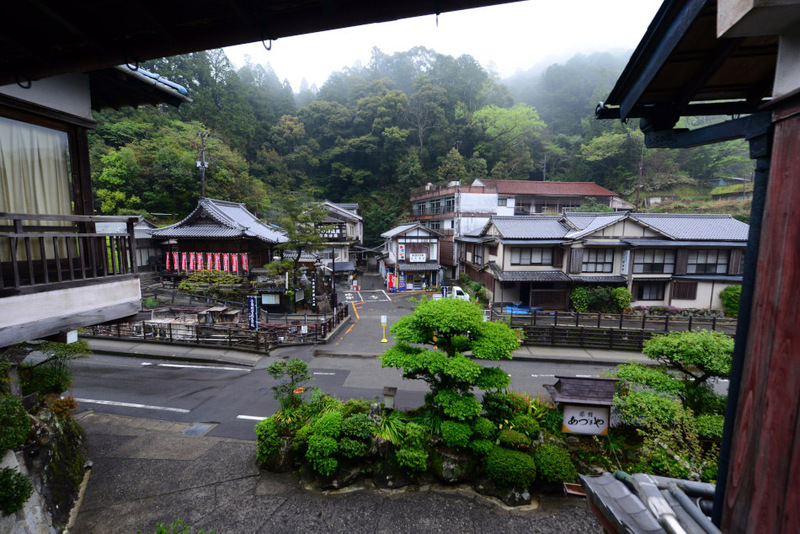 Today, this sleepy onsen village has the oldest hotspring in Japan. 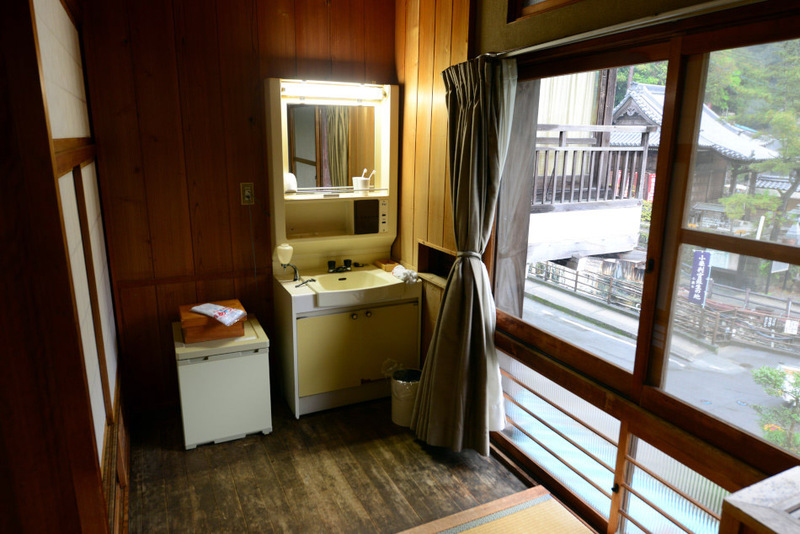 Situated at a lush green valley, dozens of timber houses, traditional ryokans and cosy bed and breakfasts cluster along a mountain stream. 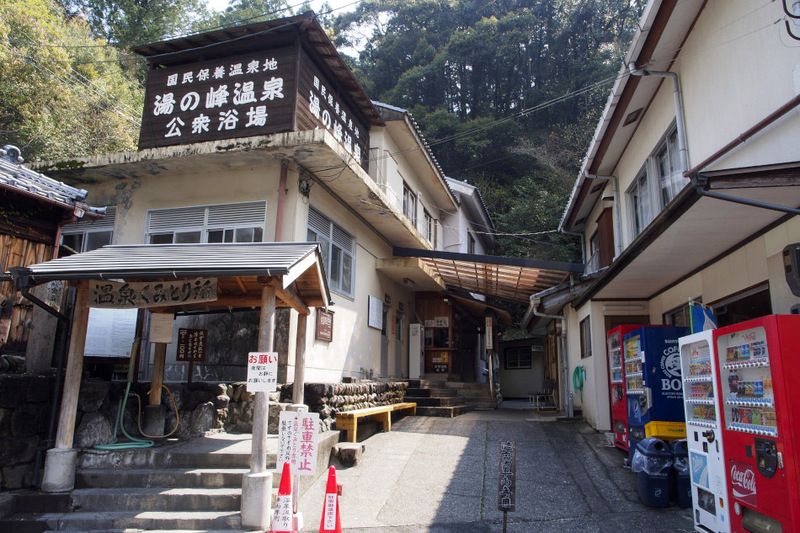 At the village centre across the bridge from Ryokan Adumaya stands a public bathhouse where visitors buy admission ticket from a vending machine. The only vehicle road passed through the centre of sleepy Yunomine. 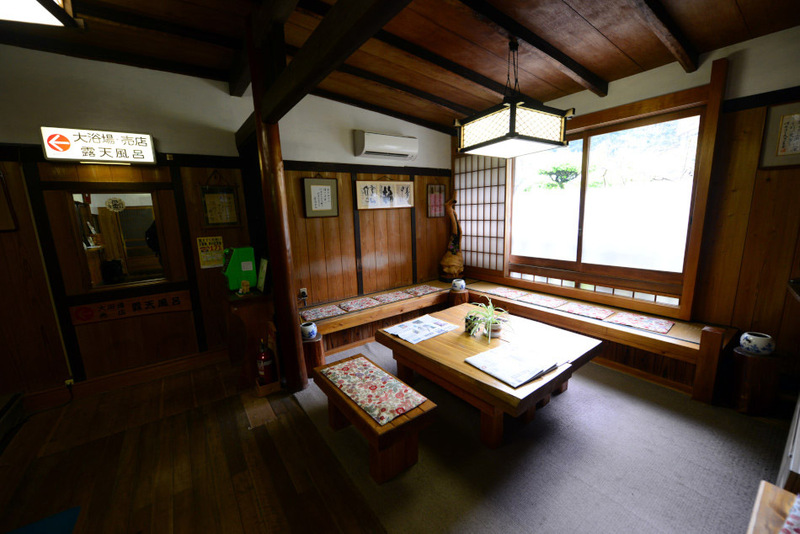 Traditional ryokans in Yunomine offer visitors a taste of vintage Japan. 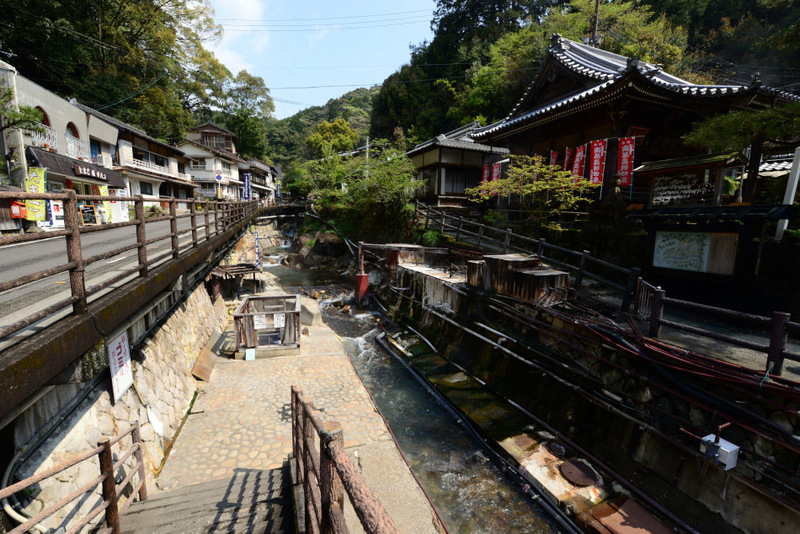 A stair leads down to the level of the stream where the fenced pool of hotspring becomes the official cooking spot with water from the hot spring. 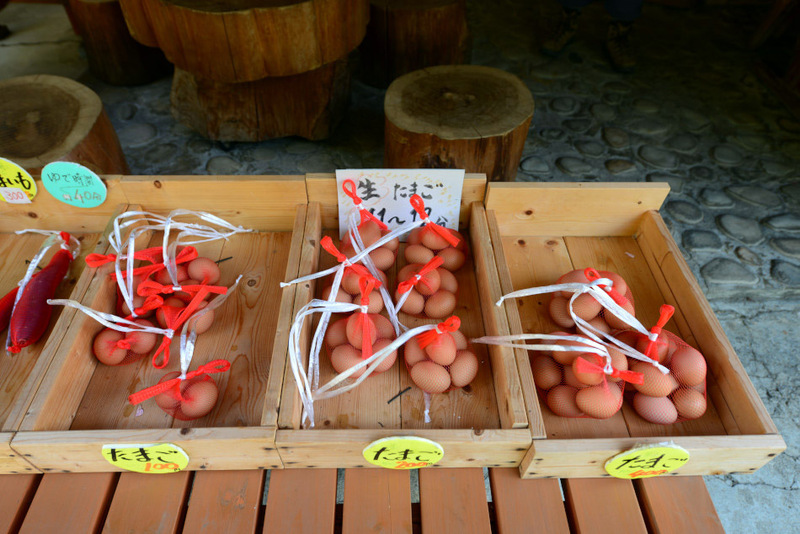 “Onsen tamago”,eggs slowly boiled in the onsen hot spring, is a popular local dish. 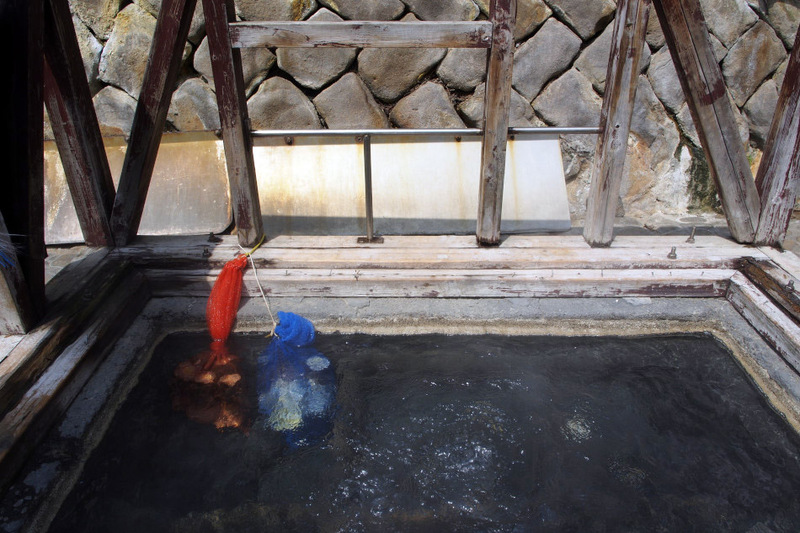 Other than eggs, the locals also love to boil yams in the 93 degree onsen water. 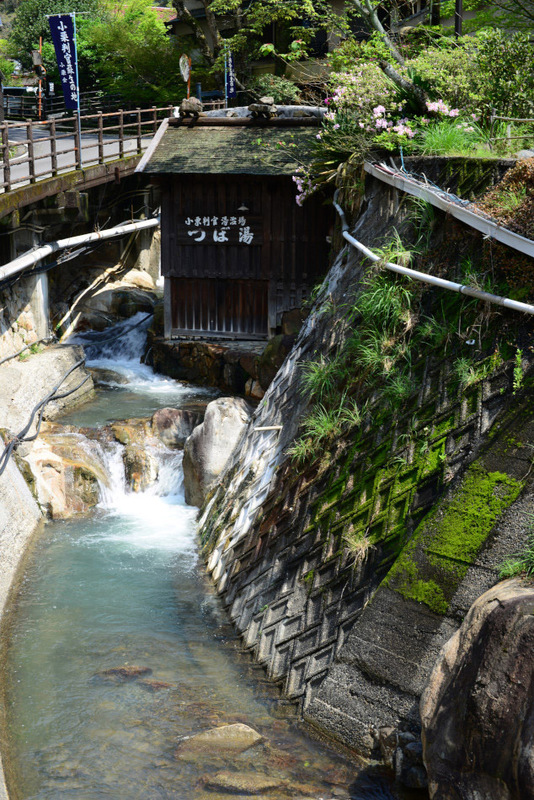 Across the stream from the egg boiling pool stands a hotspring well and pump distributing onsen water to the surrounding houses. Yunomine and its historical Tsuboyu Bath is famous as the healing spot for Hangan Oguri, a clan leader of Oguri Castle 600 years ago. In the background stands the Toko-ji Temple, the main temple in Yunomine. In front of Toko-ji Temple stands the main grocery store. The Toko-ji Temple is located beside the public bathhouse. The shrine at Toko-ji Temple. 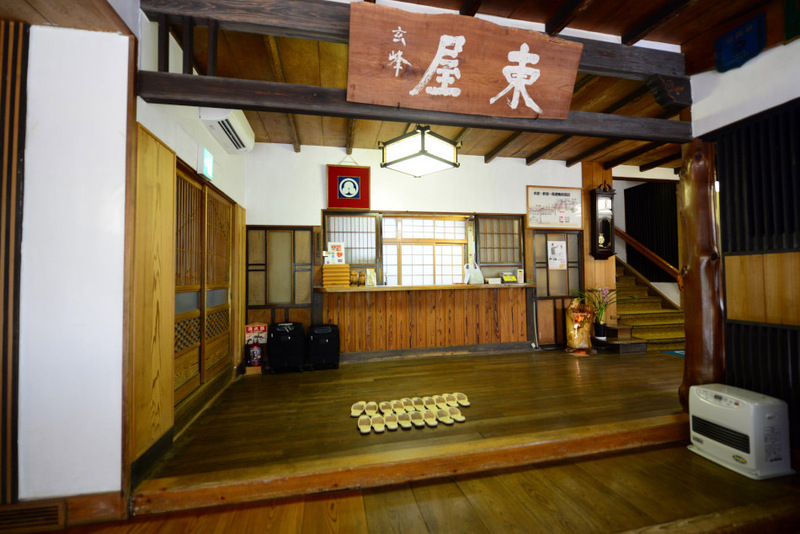 The entrance of the public bath house of Yunomine Bags of uncooked eggs are prepared for visitors to make “onsen tamago” slowly cooking in the hot spring. 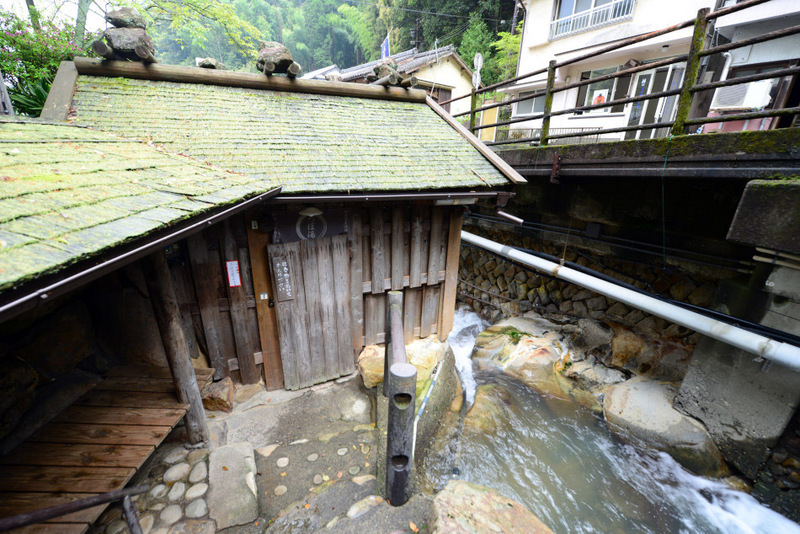 The centuries old Tsuboyu Bath is a tiny bath house by the stream. Inside it is small and dark, not ideal for people with speluncaphobia. From a distance the Tsuboyu Bath seems like a tiny wooden shed that seems vulnerable to flooding. 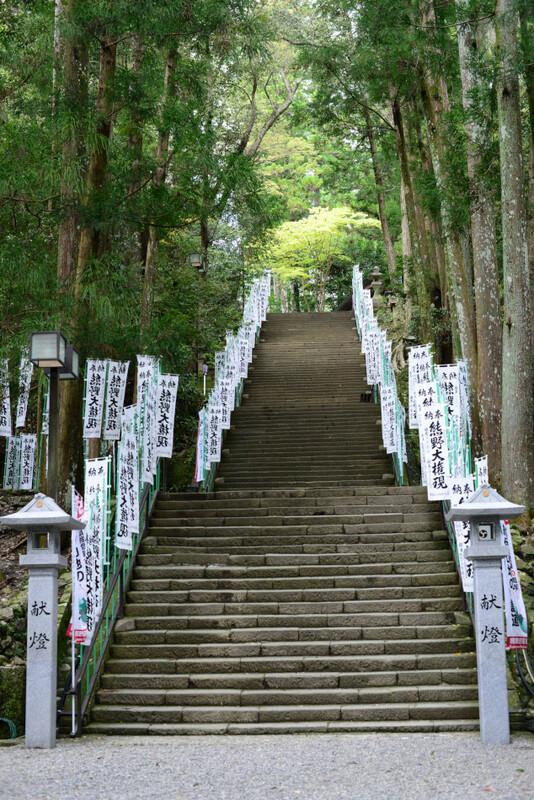 These stone steles situate high on the slope by the main road accessible only via a narrow flight of stair. 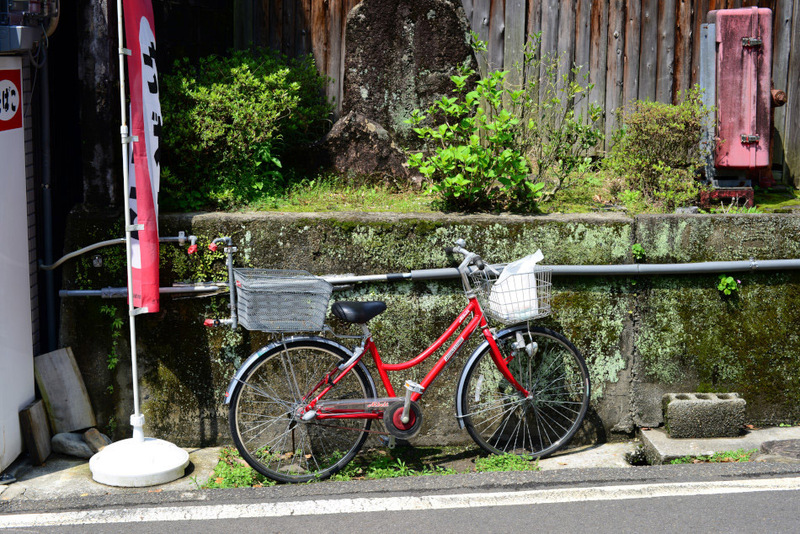 Bicycle is one of the best means to tour around the Yunomine area. 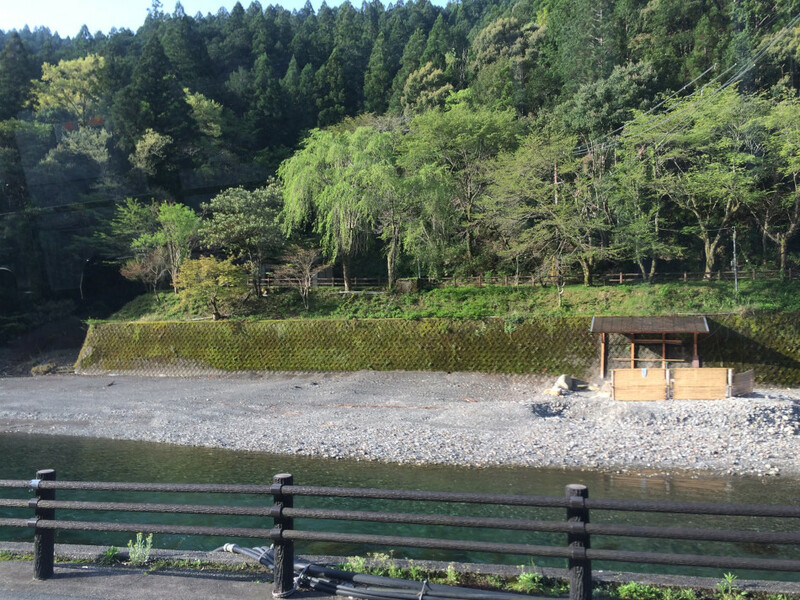 The stone wall that separates the open air onsen at Ryokan Adumaya from the main road. 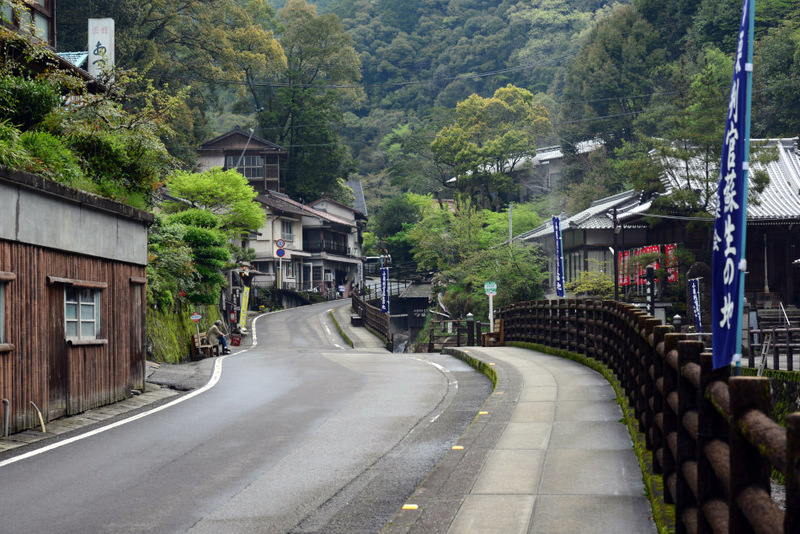 Before we left Yunomine Onsen, we had a leisure stroll around Yunomine. After the walk, we decided to return to Hongu Taisha for a second visit. After a short wait at the only bus stop in the village, we carried our backpacks up the bus heading towards Hongu Taisha. 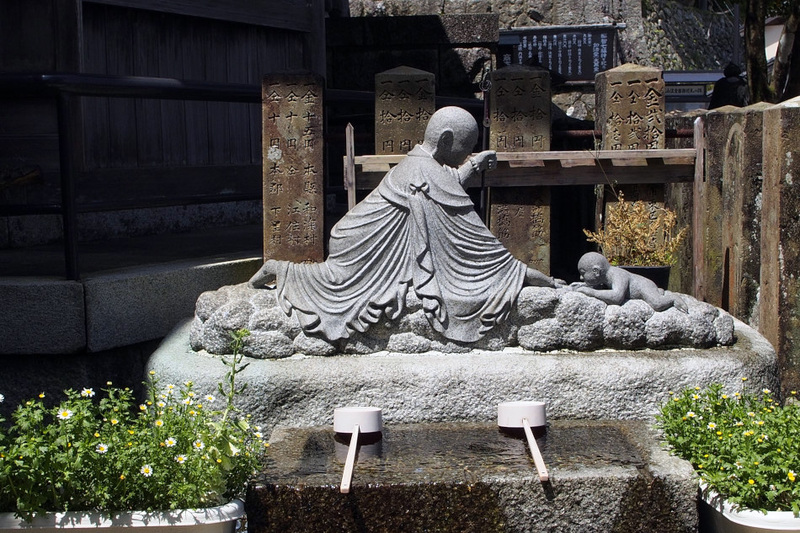 Founded by a shrine priest in the mid or late Edo Period, Ryokan Adumaya is a very traditional hotspring inn in Yunomine, the oldest onsen town in Japan. With 22 rooms all finished in traditional Japanese style, the interior of Adumaya is dominated by timber and bamboo. 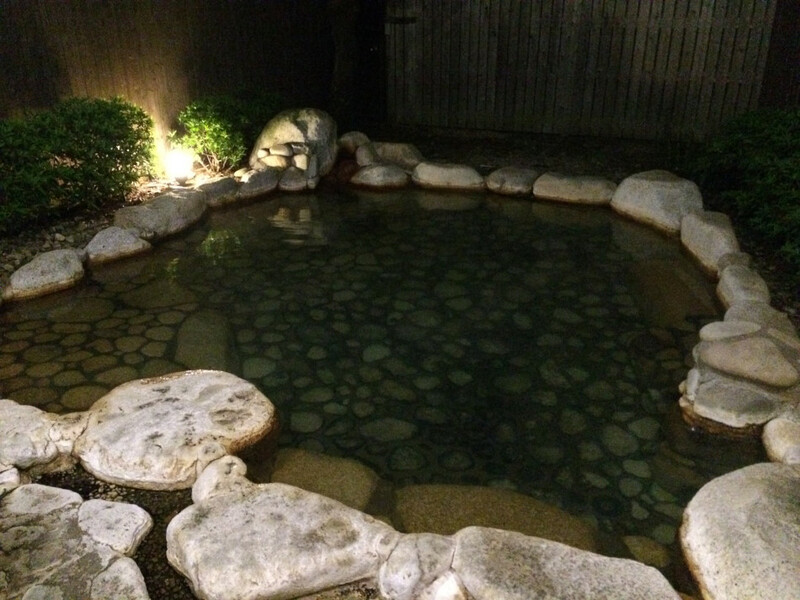 As an onsen ryokan, Adumaya has its own indoor and outdoor hotspring bathing facilities, which can be visited during the day even for visitors who are not staying the night. As hotel guests, we were able to enjoy the hotspring facilities at Adumaya 24 hours round the clock. Despite the short stay, we enjoyed the baths and delicious meals. 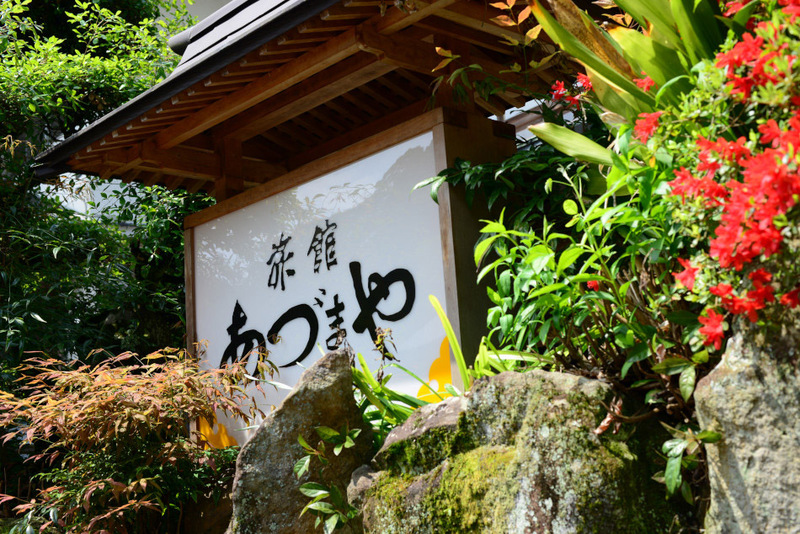 Signage of Ryokan Adumaya was erected in a naturalistic setting in front of the inn. 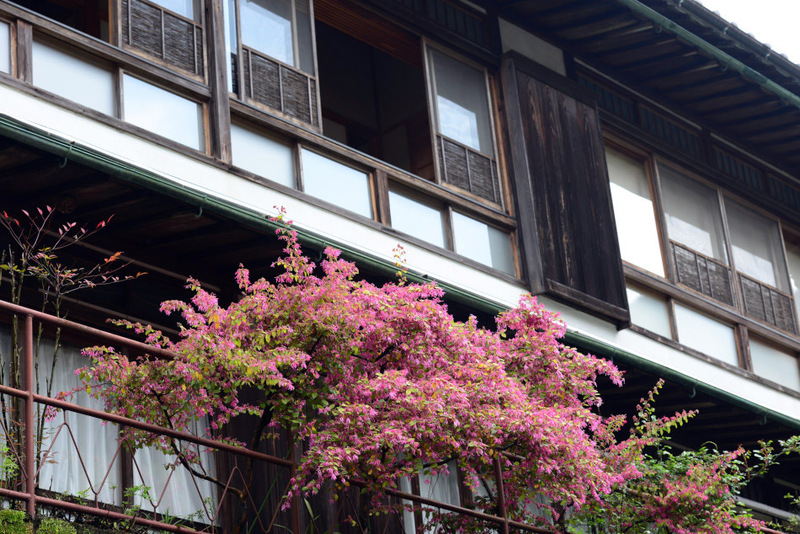 Situated in the middle of Yunomine Onse across the street from the public bathhouse, Ryokan Adumaya is one of the most prominent building in the village. 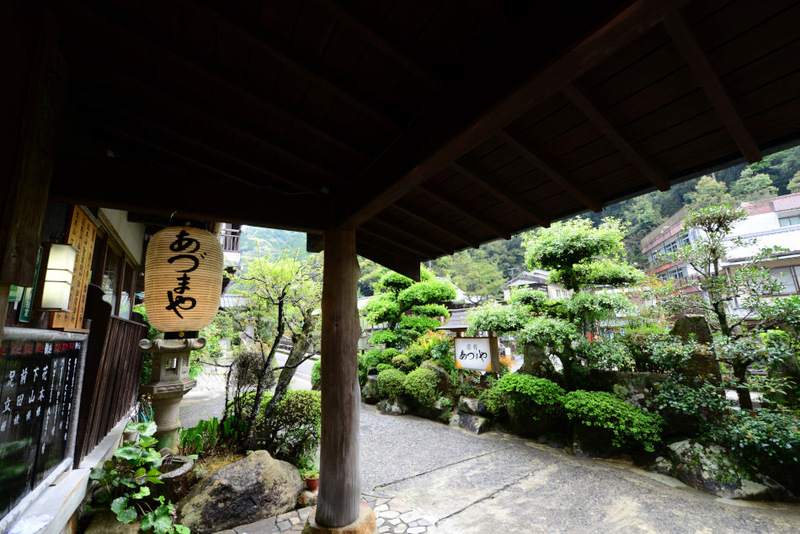 Beyond the neatly trimmed trees and bushes lies the drop off and main entrance of Ryokan Adumaya. 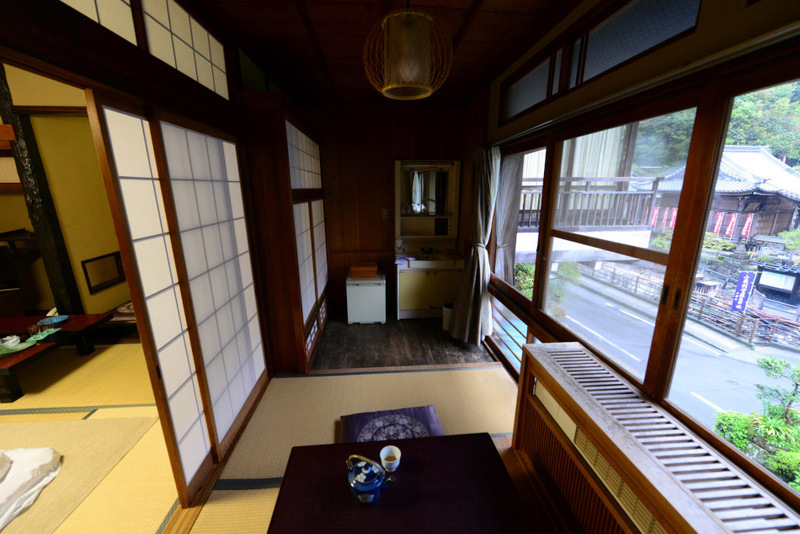 Entering the ryokan through the wooden overhang was liking going back an times of Edo Japan. 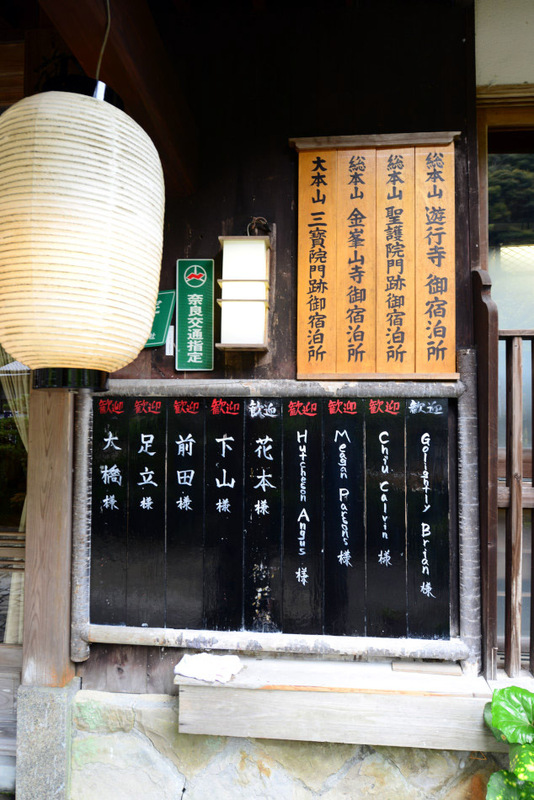 Beside the main entrance mounted a board with names of hotel guests written on it. 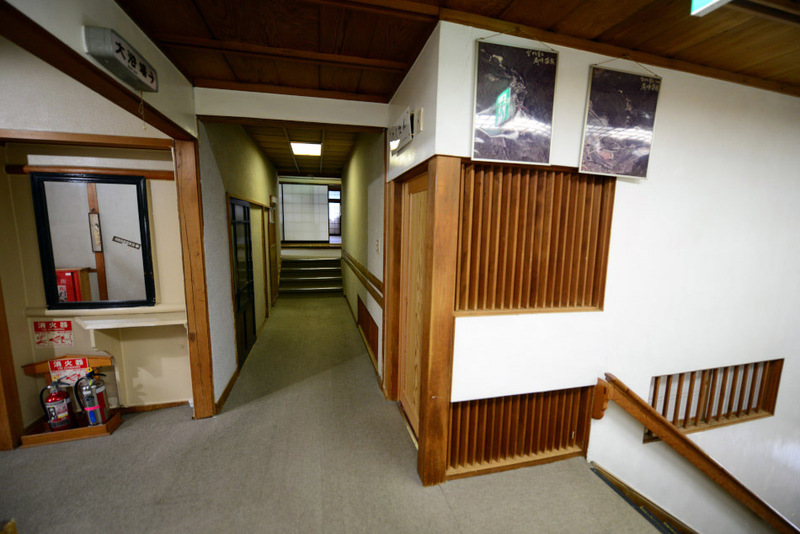 Traditional timber finish dominates the lobby and reception area. We had to take off our shoes during our stay. We could choose to put on either a pair of indoor slippers when staying indoor, or a pair of outdoor shoes for venturing out into Yunomine. The sitting area in the lobby was quite atmospheric. The door on the left led to the bathing facilities and souvenir shop. Upstairs on the second level, the entrance into our room was right at the corner next the the main stair. The wooden door then led into a vestibule and then into an anteroom before reaching the main living space of our room. The vestibule also connected to our private toilet. 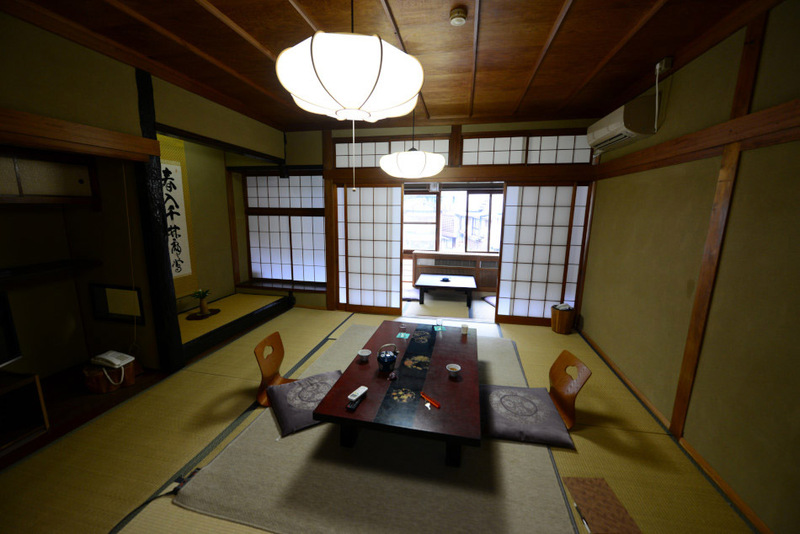 Beyond the sliding doors of the anteroom is main living space where we dined and slept on the tatami. 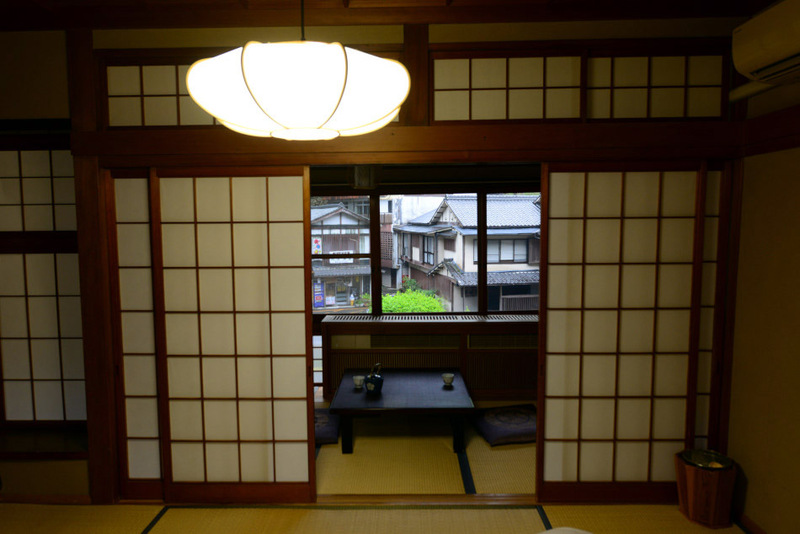 At the far end of the room there was another set of sliding door leading out to the sun room where a tea table stood. The sun room was well lit with natural light. At the far end of the sun room was the vanity counter. 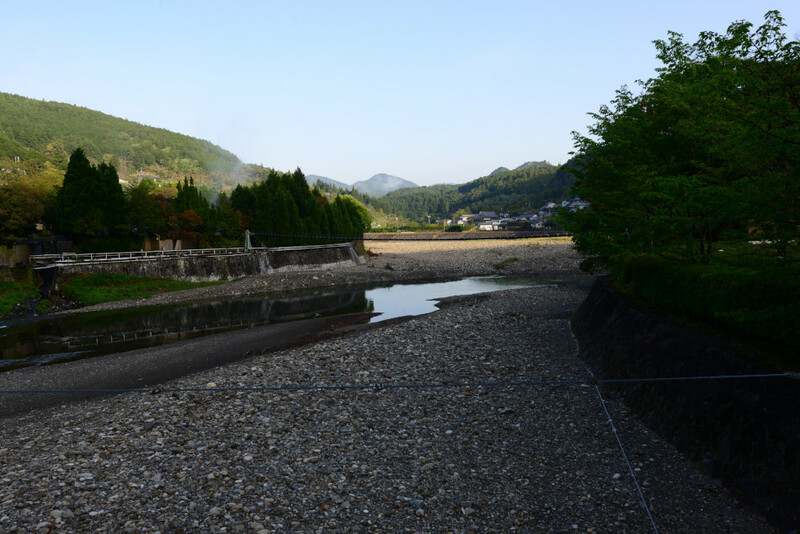 From the window we could see the main street and creek that bisected Yunomine. Beyond that stood the village shrine on the left, and the public bathhouse at further back.